All images by Richard Spjut unless otherwise indicated. 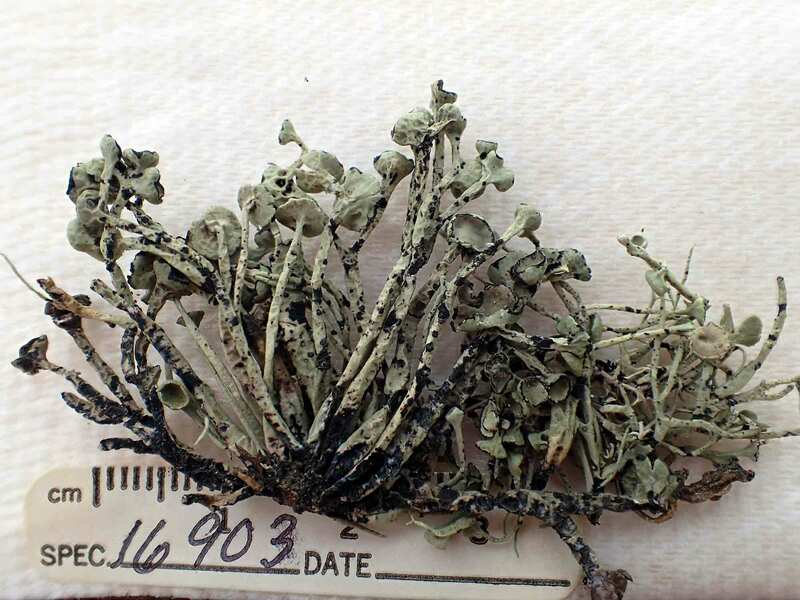 Images of specimens selected to show representative species of Cylindricaria. Niebla and Vermilacinia (Ramalinaceae) from California and Baja California. Spjut, R.W., 1996. ISSN 0833-1475, 208 pp. Sida, Botanical Miscellany 14. Botanical Research Institute of Texas, Inc.
Vermilacinia is most easily and definitively distinguished by its secondary metabolites, in which their determination are also needed for identifying the species. With experience, patterns of surface ridging can be recognized for each of the two genera as outlined in the above key. 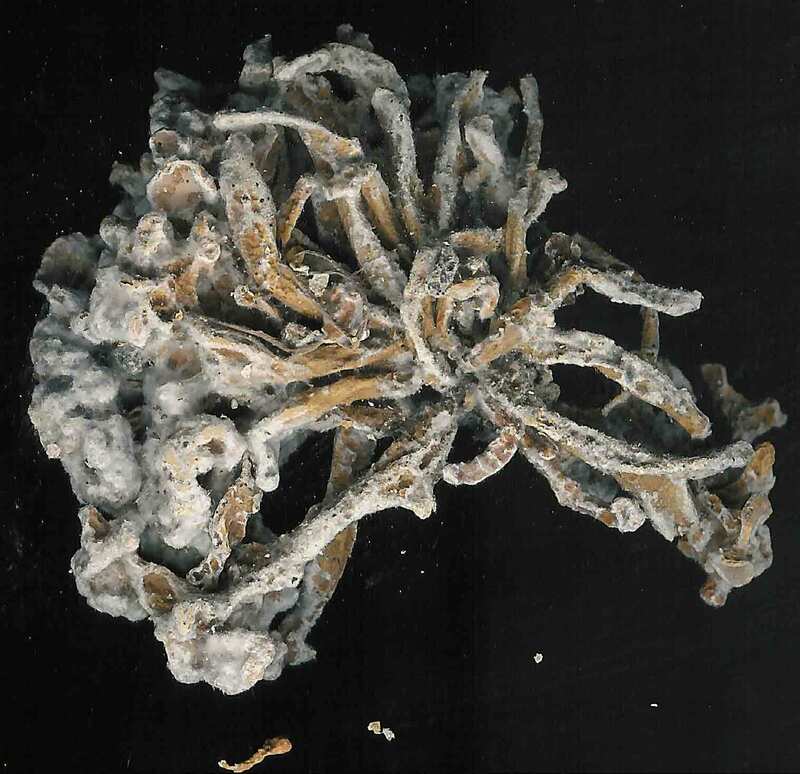 Difficulties are encountered with some forms of N. flagelliforma and N. rugosa. Their close reticulate ridging appears much like saxicolous Vermilacinia paleoderma, which often has marginal ridges, but its marginal ridges do not separate and unite at regular intervals. 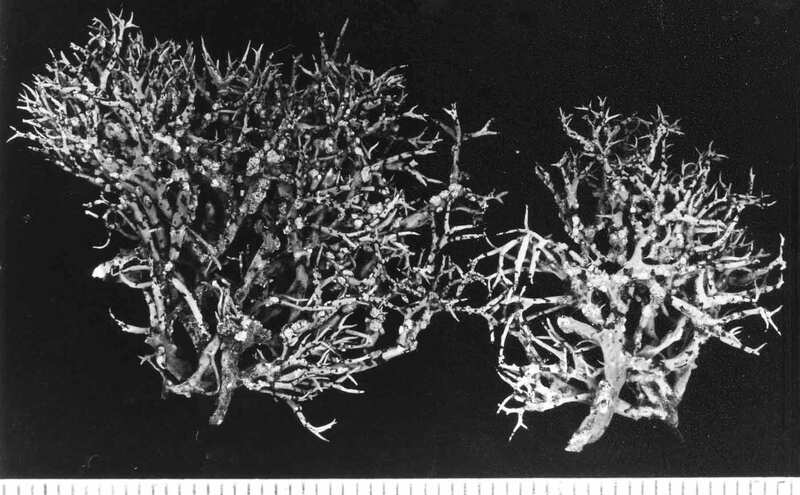 Flabellate species of Vermilacinia, V. varicosa and V. rosei, may be initially seen as Niebla since this branch morphology is rare in Vermilacinia. 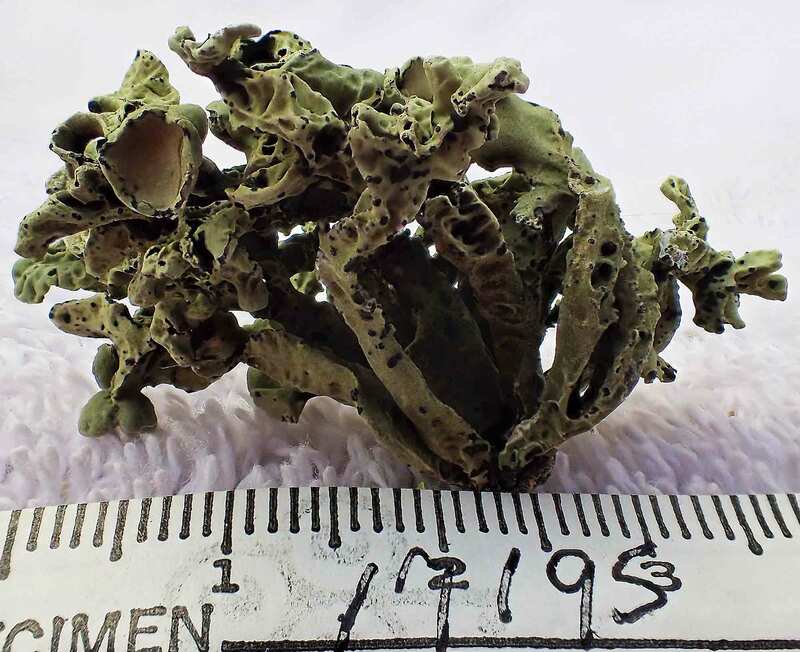 When chondroid strands are present, they can usually be seen with the naked eye, but when absent, one never is really sure until a thallus branch is sectioned and viewed under the microscope. 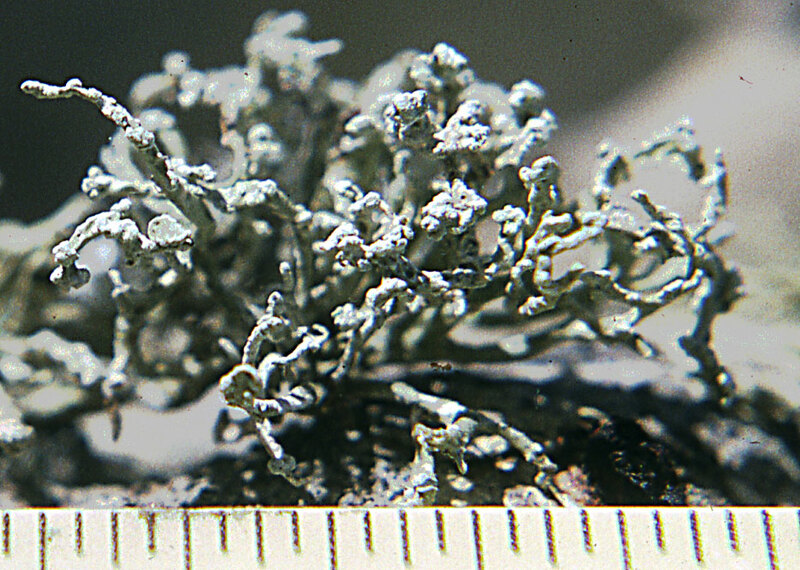 Subterminal apothecia are generally characteristic of subgenus Cylindricaria, the apothecium usually accompanied by a relatively short continuous branch or spur shoot that ascends abruptly upwards as shown above for V. leopardina. This is in contrast to subgenus Vermilacinia with terminally positioned apothecia in most North American species, or lateral to subterminal positioned apothecia in South American species. 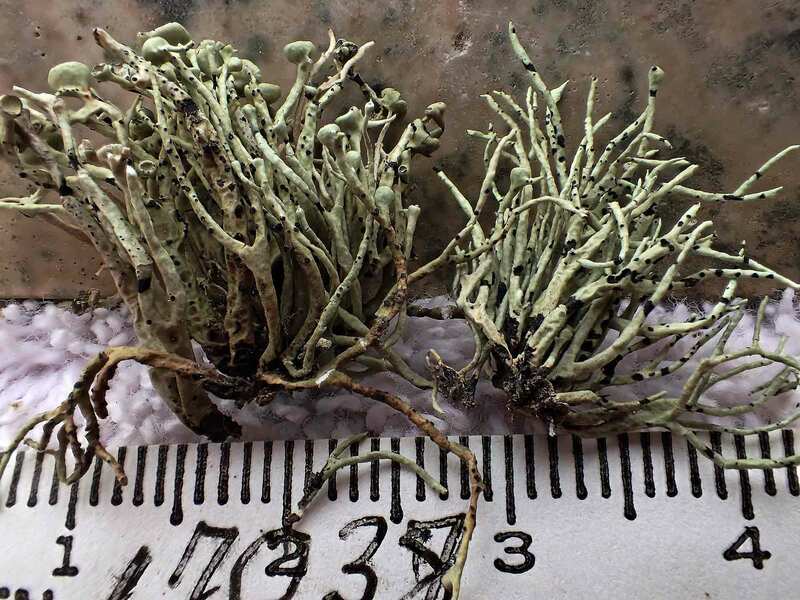 A mildew-like appearance begins to develop on herbarium specimens of Vermilacinia in approximately six months after a specimen has been collected, and the conditions continues to worsen as time passes. 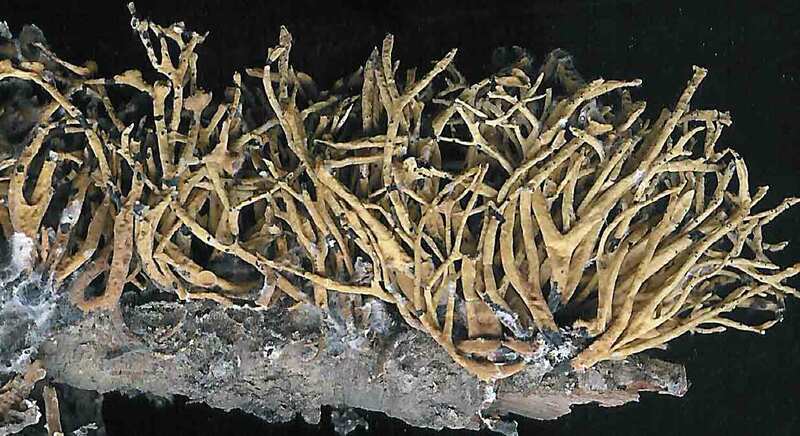 This is the result of efflorescence—a chemical change associated with the breakdown of the cortex through which the internal (medullary) hyphae seem to grow out of; however, efflorescence can be prevented by storing specimens in a refrigerator below 40°F, although there may be a trade-off in that long term storage in a frost-free refrigerator causes the cortex to become brittle over time (observed for ~9 yrs). 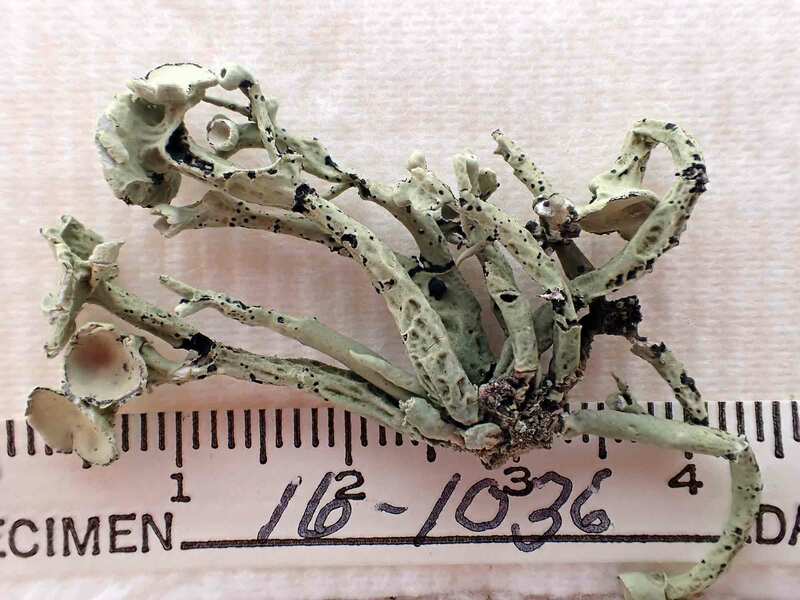 The decorticating condition has been attributed to [-]-16 α-hydroxykaurane, a diterpene found in all species of subgenus Vermilacinia, most North American species of subgenus Cylindricaria, but not in Niebla (Spjut 1995, 1996). 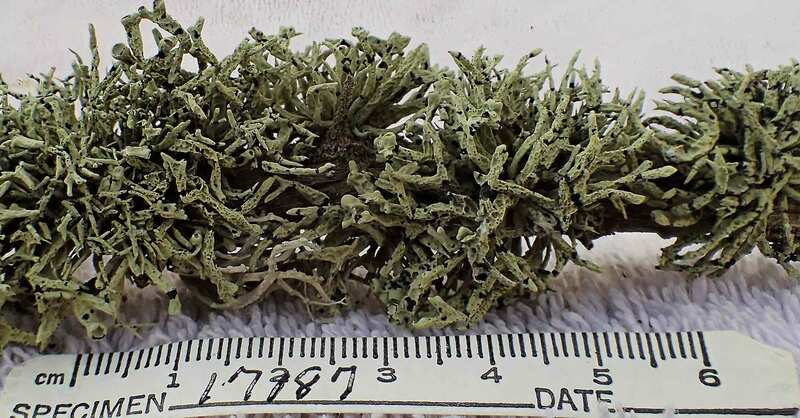 This diterpene is apparently rare in lichens, although known in mosses (Physcomitrium). 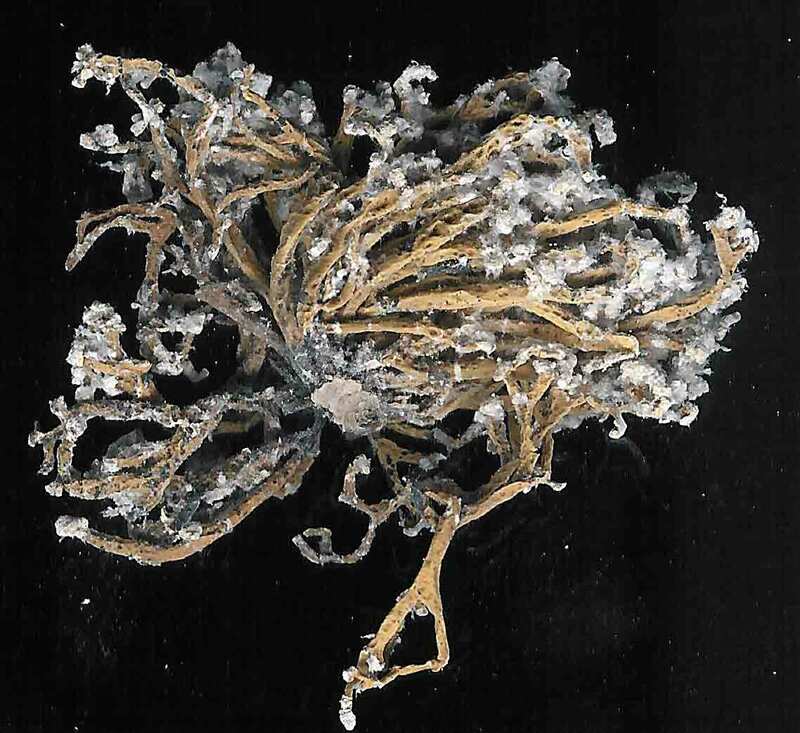 Efflorescence is common in most species of subgenus Vermilacinia and in some species of Cylindricaria that contain bourgeanic acid or the T3 compound (Spjut 1996); the Cylindricaria species include the sorediate V. cephalota, V. cerebra, V. leonis, and the chemically related nonsorediate V. cerebra and V. tigrina. 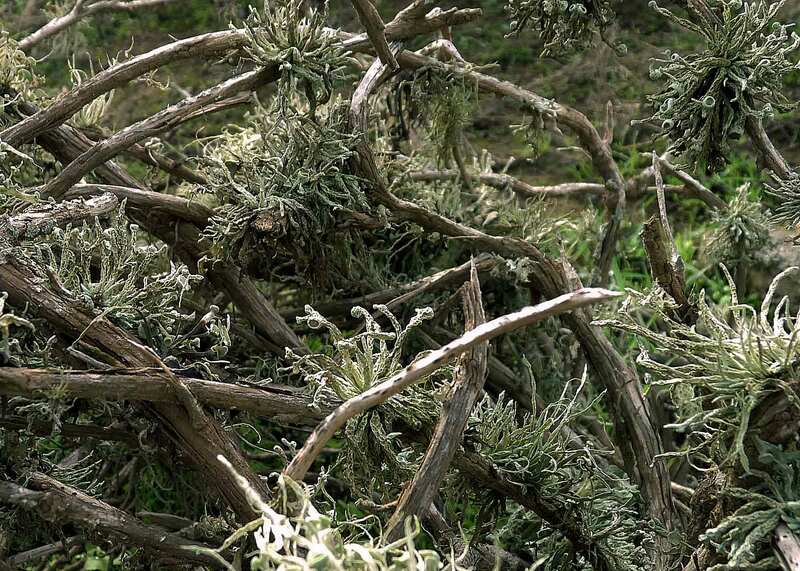 The terpenoid compounds that characterize Vermilacinia have not been reported in Niebla (Spjut 1996). Indeed, Niebla and Vermilacinia have little in common in their major secondary metabolites. The taxonomic significance of the Vermilacinia diterpene, along with bourgeanic acid found only in the New World species, is supported by molecular data for the Old World 'Bourgeana clade'—in which species classified in Niebla by Rundel and Bowler (1978) and Bowler & Marsh (2004)—are nested within the Old World Ramalina (Sérusiaux et al. 2010). 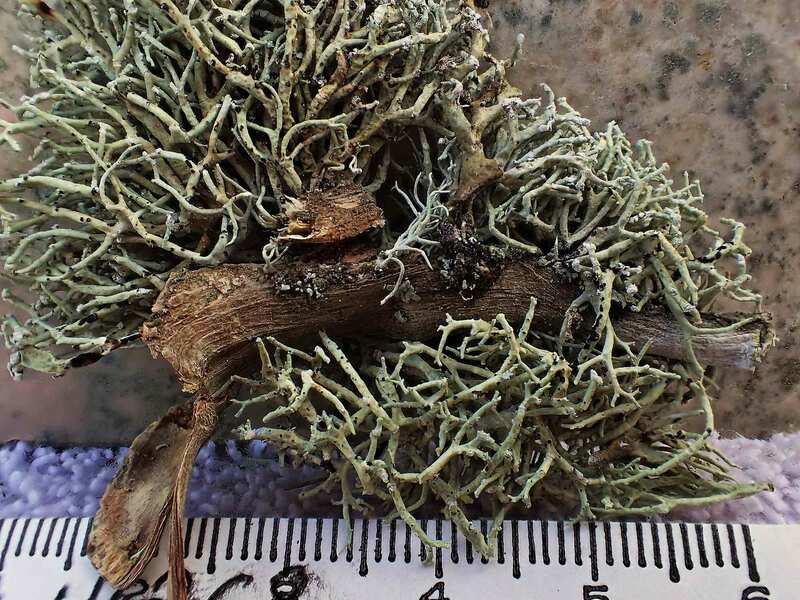 Vermilacinia Subgenus Cylindricaria is easily recognized by the thallus divided into cylindrical branches from a holdfast attached to bark of shrubs or trees, rarely on rock as reported for sorediate species V. cephalota and V. tigrina. The cortex is membranous and relatively thin (15–30 µm) over a loose network of longitudinally oriented medullary hyphae that converge at regular intervals into knotted bundles. This network arrangement allows for the collapsing and expansion of the cortical matrix onto the cortical ridges as desiccation (dissipation) and hydration develops from the advance and dissipation of fog. 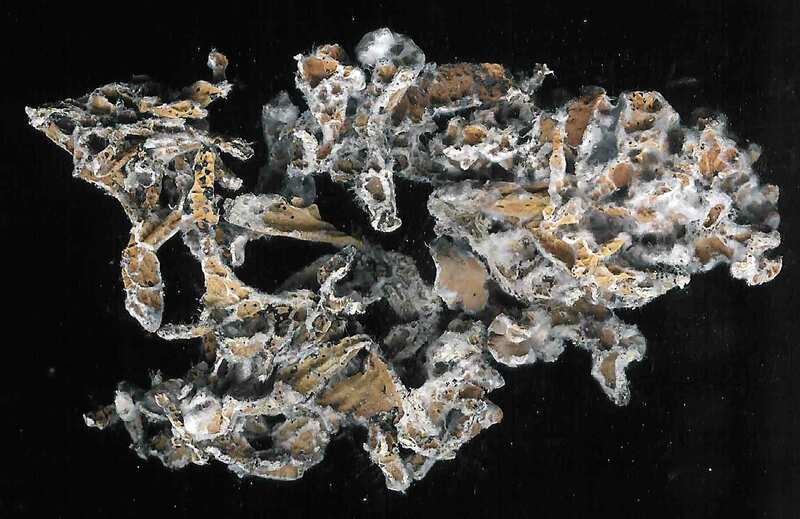 Subgenus Cylindricaria is further characterized by having black pycnidia that evidently develop into larger black spots or transverse bands, and by the absence of distinct medullary chondroid strands, and by apothecia spur shoots (appendiculate). 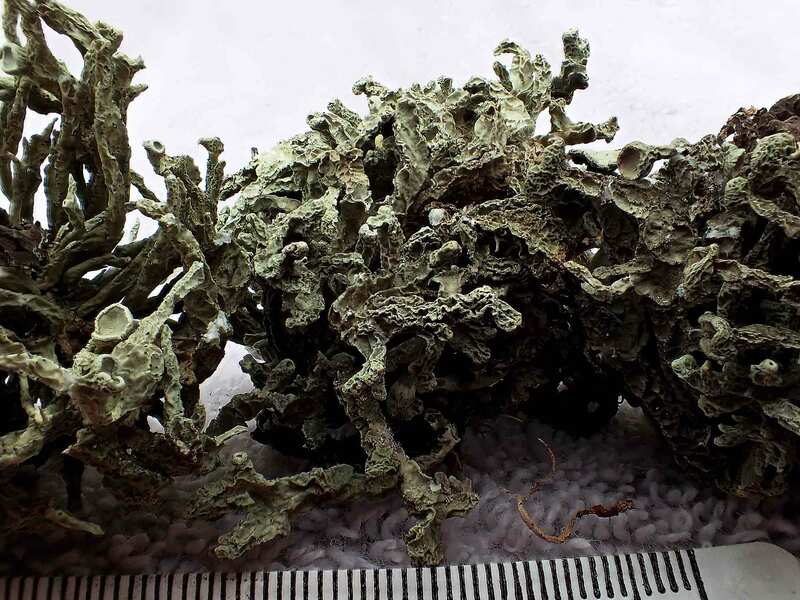 It should be noted that the name "Niebla ceruchis," regarded as a synonym of V. ceruchis (Spjut 1996), applies to a terricolous and saxicolous species in South America in subgenus Vermilacinia. The is based on the type specimen collected by Menzies—described and named by Acharius (1803) Parmelia ceruchis. 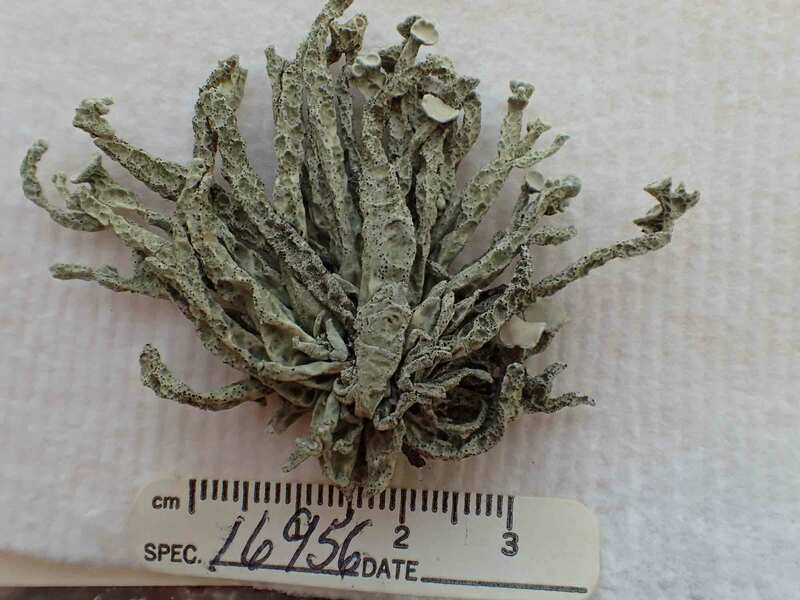 The type appears to be from a terricolous thallus judging from its morphological and chemical attributes similar to specimens at Harvard (FH) reportedly collected by Darwin from the coastal South American desert in northern Chile. 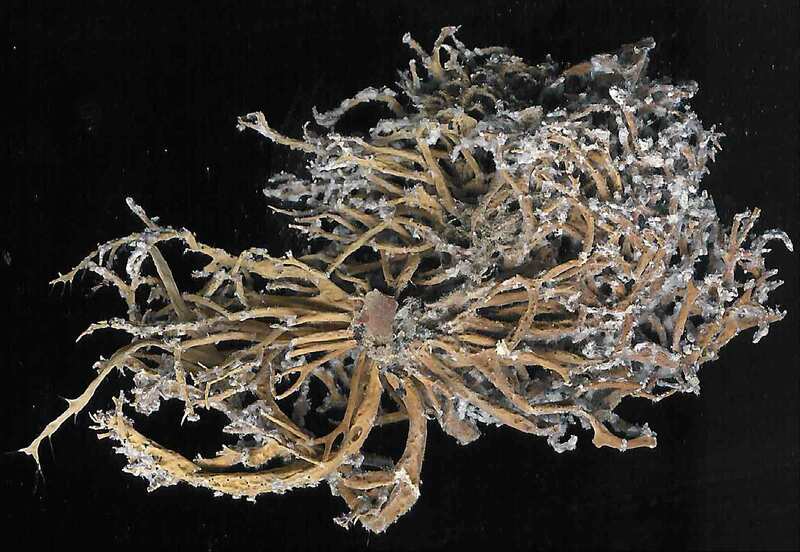 Darwin noted that it was the only “plant” lying loose on sand for “16 leagues inward.” The Darwin specimens studied in detail by Spjut (1996) were found to have a relatively thick firm cortex characteristic of subgenus Vermilacinia. 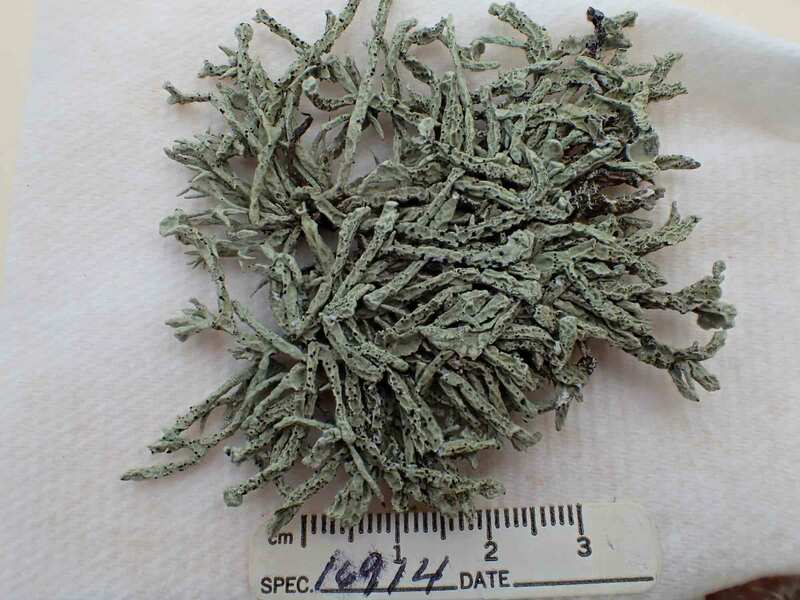 TLC of a Darwin specimen revealed three terpenoid compounds as seen in an image of the TLC data for the type of V. ceruchis. 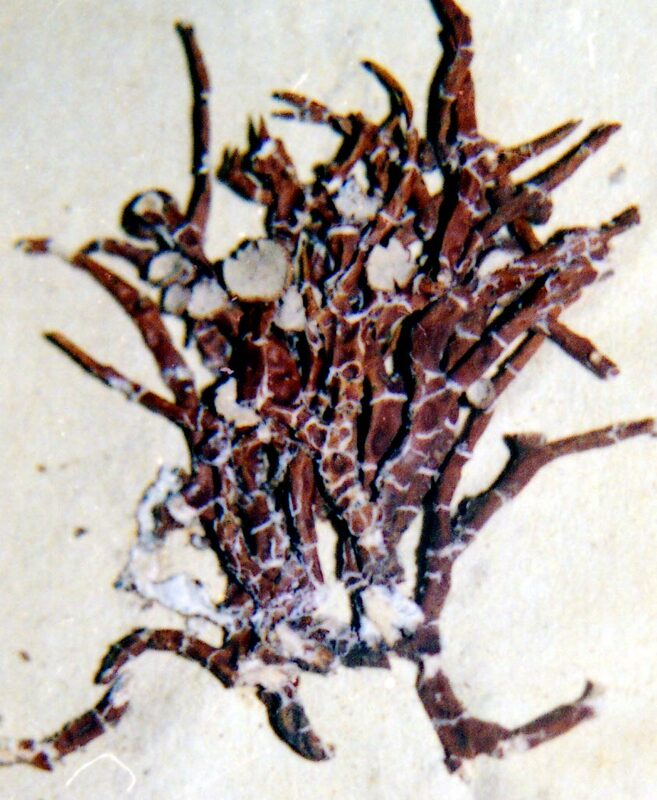 Thus, V. ceruchis is clearly more related to the saxicolous V. combeoides than to the corticolous species. Vermilacinia tigrina—not mentioned by Bowler and Marsh (2004) in their revision of Niebla—appears to be the earliest species name for the corticolous group, distinguished by Bowler (1981) and similarly by Spjut (1996) from the saxicolous species group, while it maybe added that Bowler and Marsh (2004) did not mention V. tigrina in their revision of Niebla. Notwithstanding, the name Niebla ceruchis has continued to be misapplied to corticolous species in North America (Bowler & Marsh 2004). 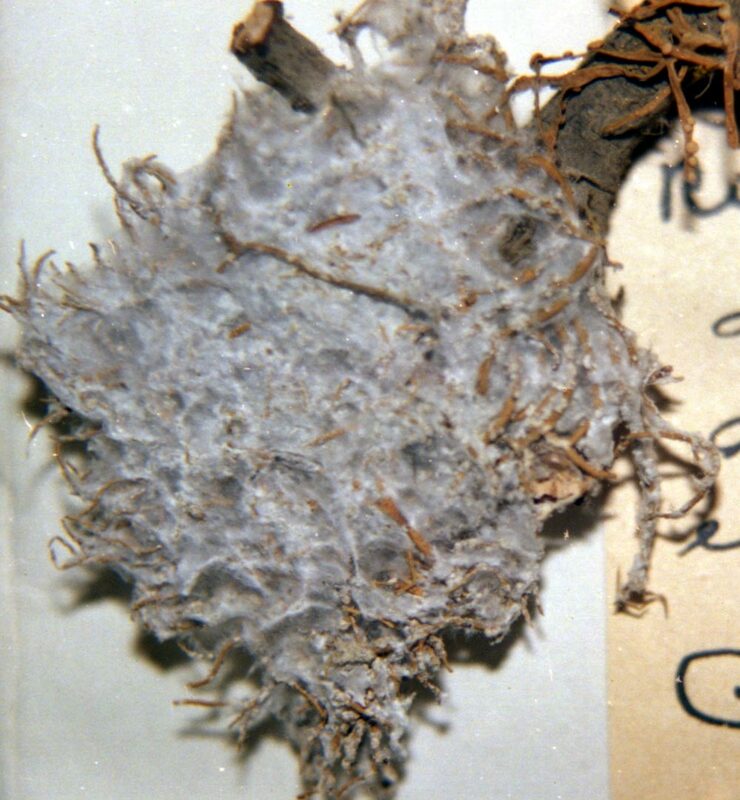 The application of this name to North American corticolous species apparently originated from Howe (1913), although Tuckerman (1866) had earlier reported that he had received specimens identified as Ramalina ceruchis. They were collected on shrubs near San Diego and San Francisco, but this was before Nylander's (1870) monograph. 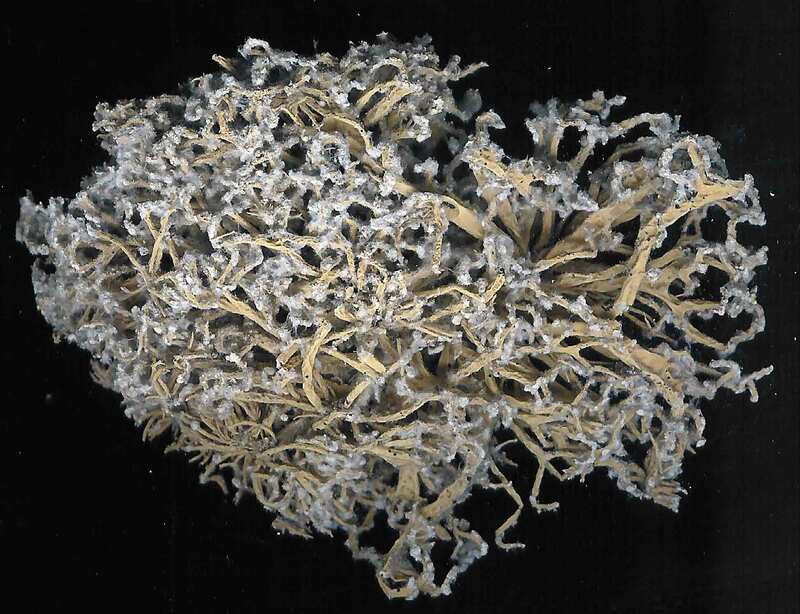 Nylander (1870) considered the North American corticolous species to belong to what is now a saxicolous species, Niebla (Ramalina) testudinaria. 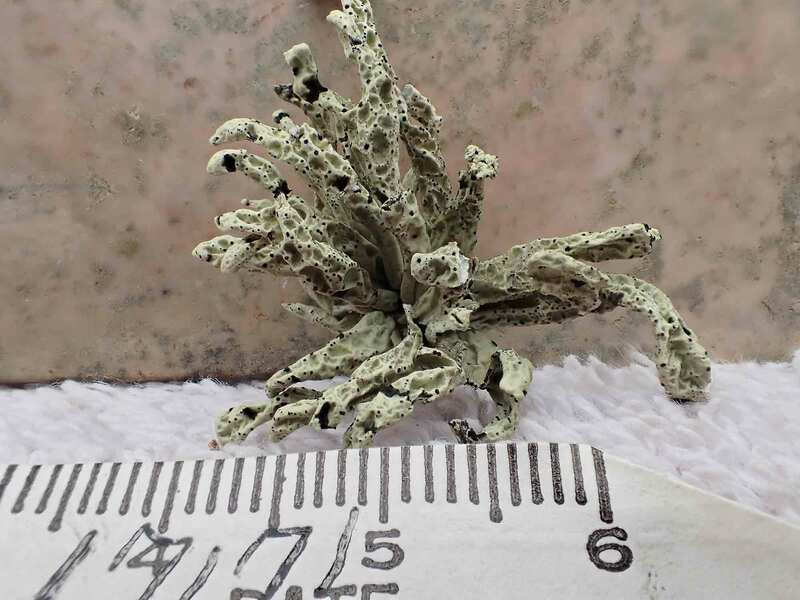 Evidently, the honeycomb-like cortical surface seen in N. testudinaria and V. leopardina was considered by Nylander to be diagnostic for treating the variation under the same species (Ramalina testudinaria). 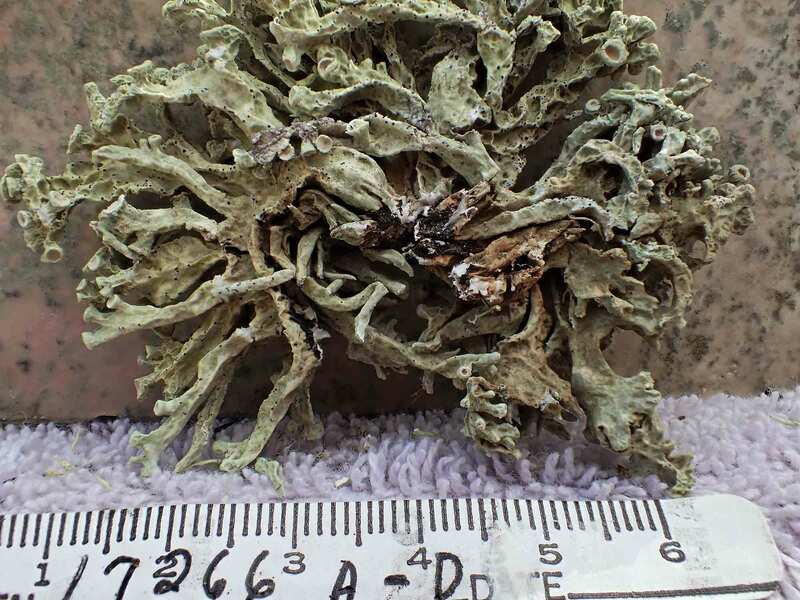 Ramalina ceruchis was considered by Nylander (1870) to occur only in South America, on trees and shrubs in Chile and Peru, and his description for a new North American species, R. combeoides, was placed closer to R. ceruchis than to R. testudinaria. Again, key differences between the two subgenera were recognized by Bowler (1981) based on his detailed anatomical study of the cortex of many Ramalinacea genera, but the wrong species name was applied to the corticolous Niebla group. 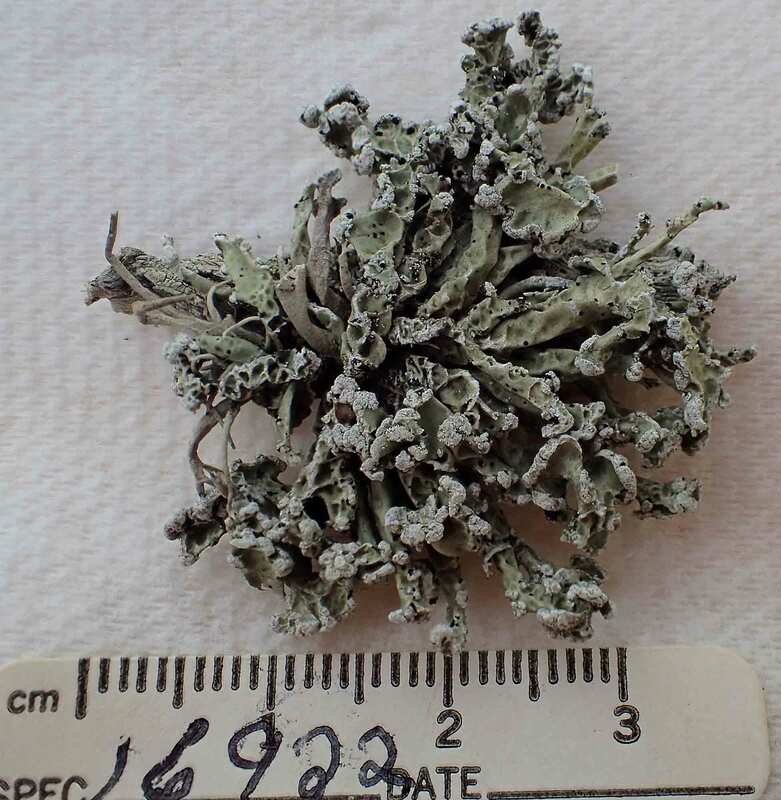 This may be due in part to not having studied all the relevant type specimens of Ramalina. 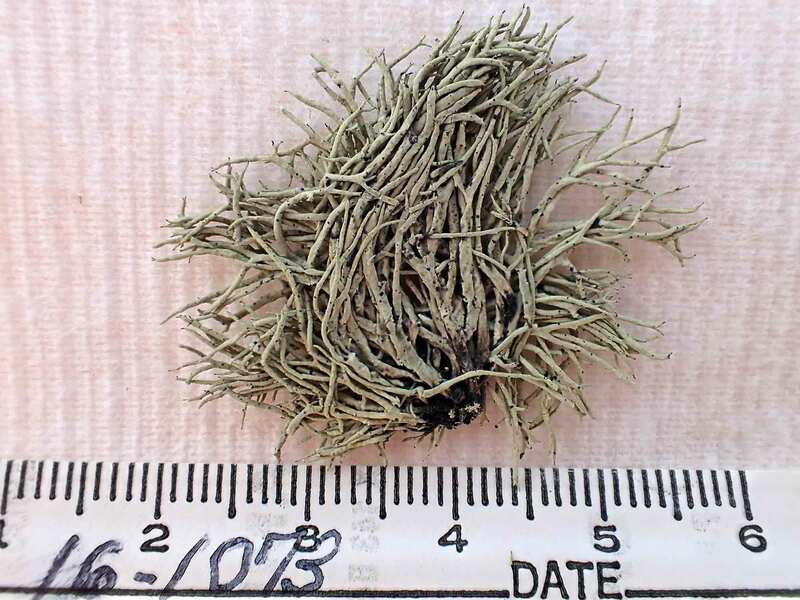 As reported by Spjut (1996), species indicated to have specific lichen substances lacked reference to type specimens; for example, the depside tumidulin (= 3,5 methy dichlorolecanorate) reported by Follmann (1966) to have been found in Ramalina tumidula, treated as a synonym of V. ceruchis by Spjut (1996), was not present in the type specimen. 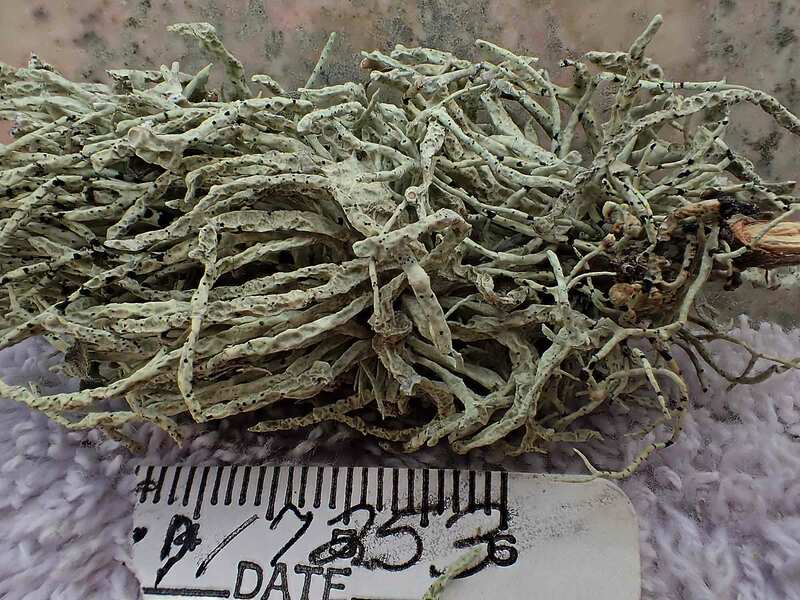 The misapplication of names are applied in later studies, leading to further confusion as to which lichen substances may be present in a species. 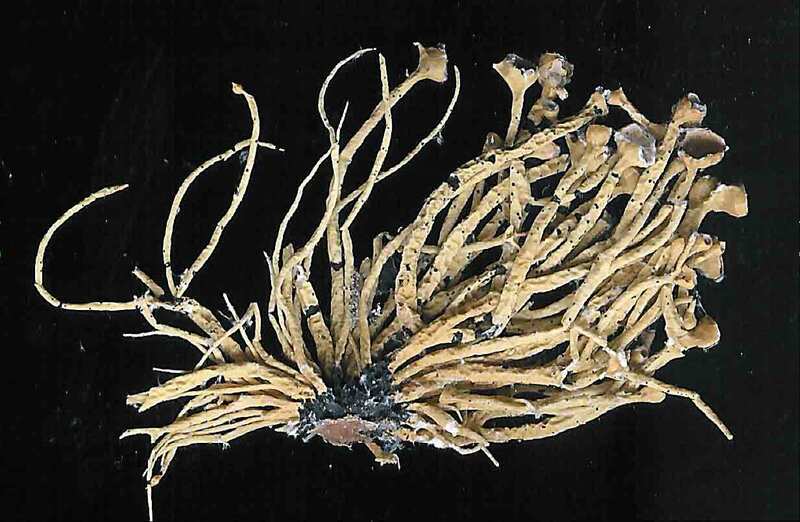 For example, specimens of subgenus Vermilacinia in the U.S. Natl. 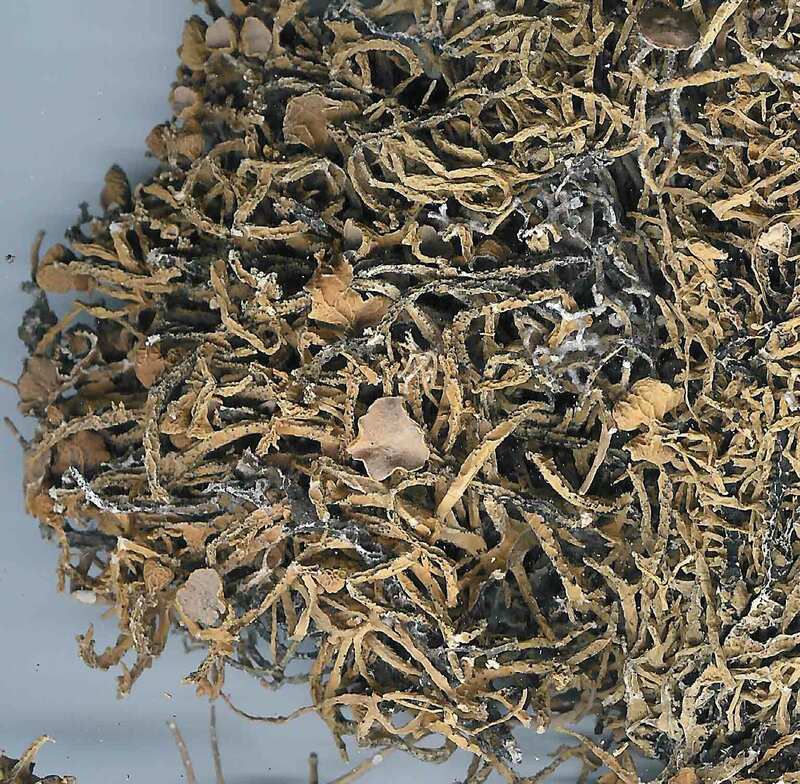 Herbarium, had been erroneously annotated by Rundel and Bowler—in their study of Niebla—to have methyl 3,5 dichlorolecanorate. 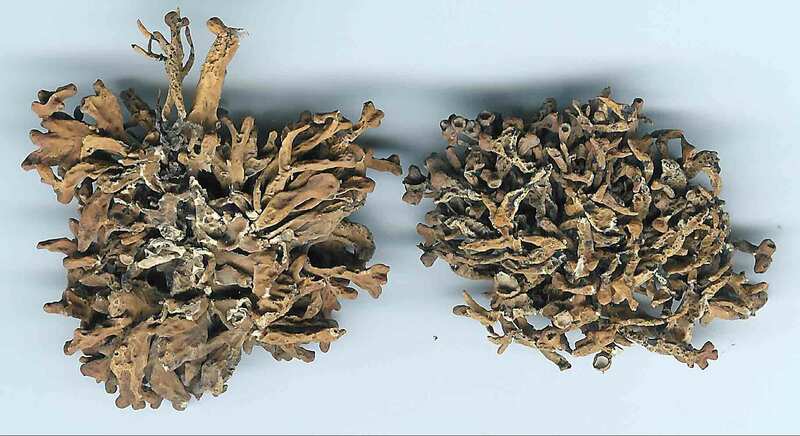 Specimens of Vermilacinia cedrosensis and V. paleoderma collected by Spjut in Baja California and analyzed by chemists of the Natural Products Group in the National Cancer Institute could not identify any methy dichlorolecanorate. 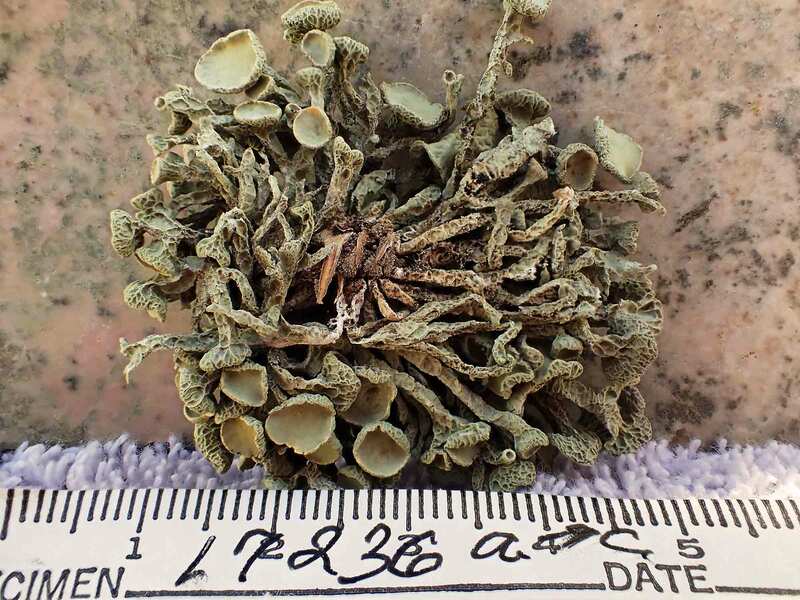 Subsequently, Spjut (through Mason Hale) sent a South American specimen of subgenus Cylindricaria—that he tentatively identified as having the depside—to C. Culberson who—along with A. Johnson–confirmed its presence. This depside was then recognized by Spjut (1996) as a key taxonomic character for V. flaccescens, a corticolous species he regarded endemic to South America. More recently, it seems that the triterpene zeorin was confused with the diterpene in V. tuberculata (Niebla t., Riefner et al. 1995; Spjut annotation labels for COLO loan). Two common species, Vermilacinia leopardina and V. corrugata, are recognized by their cortical differences. 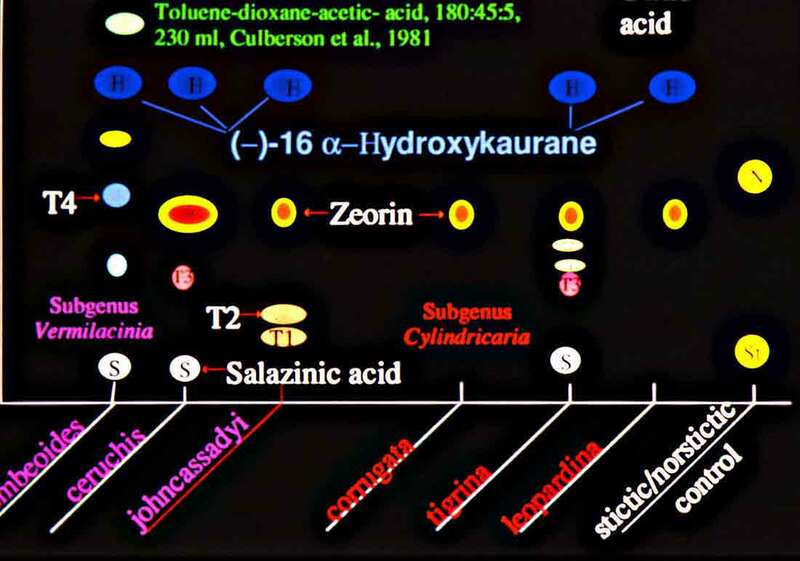 They appear related to zonal moisture differences correlated with the occurrence of the secondary metabolite diterpene [-]-16 α-hydroxykaurane. 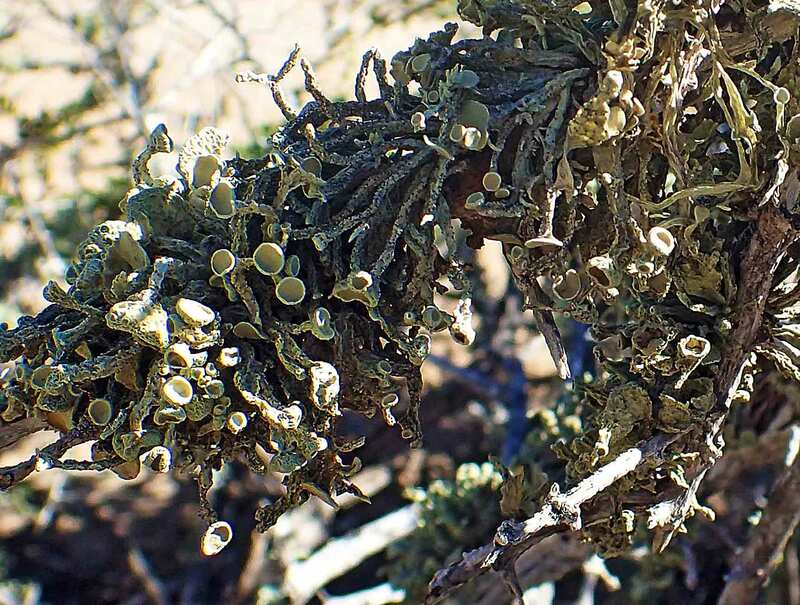 For example, in the Northern Vizcaíno Desert of Baja California, V. leopardina, which has the diterpene, is more common along the immediate coast. In contrast, V. corrugata, which lacks the diterpene, occurs further inland, or on leeward slopes where moisture from fog dissipates. The cortical surface of the former species generally appears smooth in texture, whereas in the latter, the cortex is deeply and/or sharply rugose. On the Vizcaíno Peninsula (Southern Vizcaíno Desert), a reverse relationship is evident. The absence of the diterpene is seen in thalli with a relatively smooth cortical features, usually with crater-like rounded depressions; they are referred to V. howei. which occurs more often near the coast than V. nylanderi, a species with a strongly rugose cortical surface that contains the diterpene. Vermilacinia howei is most common in the western half of the Vizcaíno Peninsula. 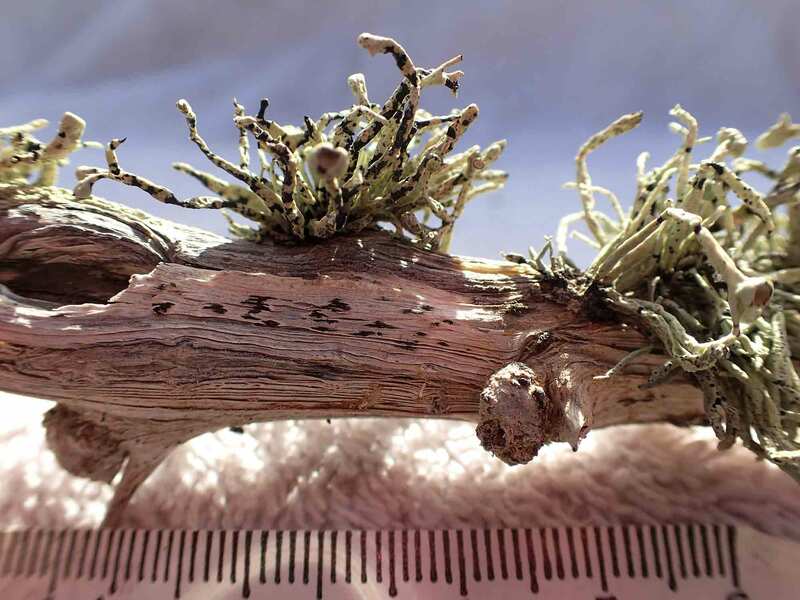 It was also reported on the main peninsula of Baja California and in the Channel Islands where thalli are relatively small with erect basal capillary branches without apothecia. The northern occurrences of V. howei may prove to be another species, in which case then V. howei would be endemic to the Southern Vizcaíno Desert. 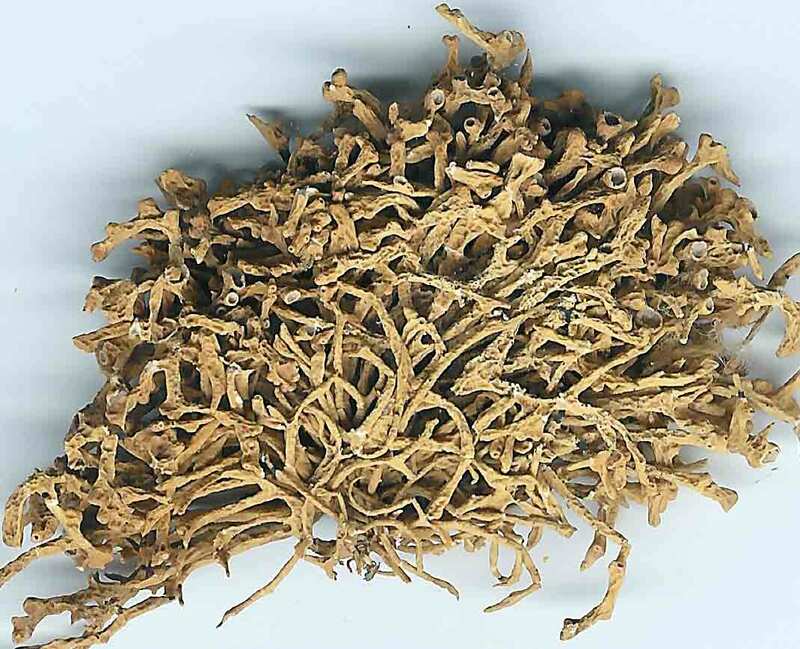 Another feature of taxonomic significance in Cylindricaria is the development of soralia. At least four species have soralia (only one species recognized in Bowler & Marsh 2004). The sorediate species, and two related nonsorediate species, V. cerebra, and V. tigrina, produce bourgeanic acid and depsidones. Additionally, Sipman (2011) recognized a South American species with apical soralia in contrast to lateral soralia seen in the other species, although in some V. cephalota they appear restricted terminally on short pinnately arranged branchlets for a short distance near the end of a primary branch. 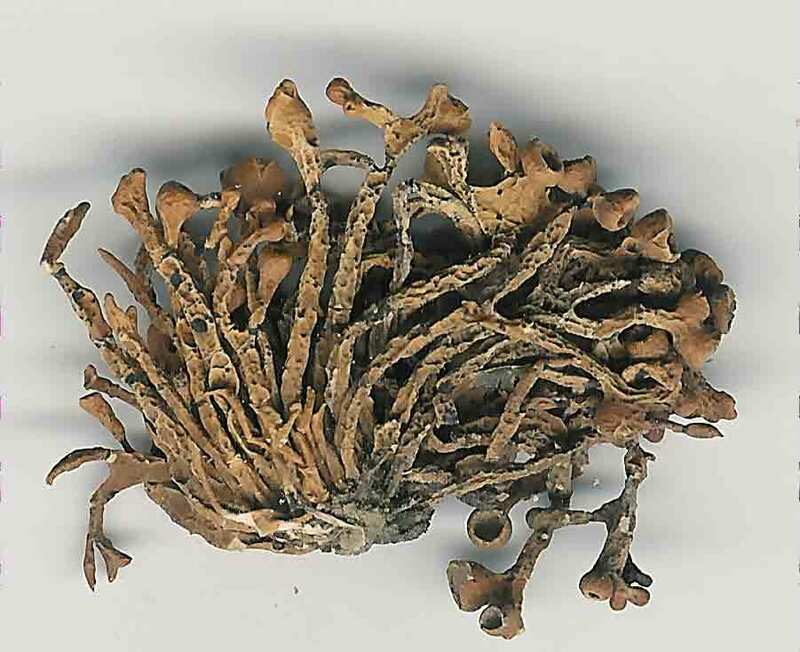 Also, V. cerebra may appear sorediate terminally by aborted development of apothecia where the cortex appears to slough off with age. 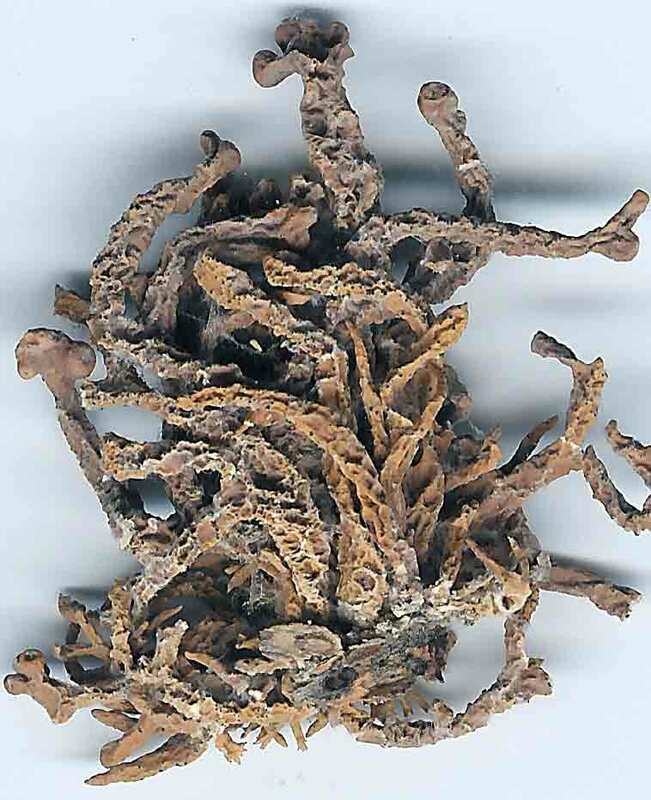 Vermilacinia zebrina, recognized by Spjut (1996), differs from V. cephalota in its much dichotomously branched thallus of capillary branches, the branching more frequent towards apex; the interval branches thus becoming shorter in length. 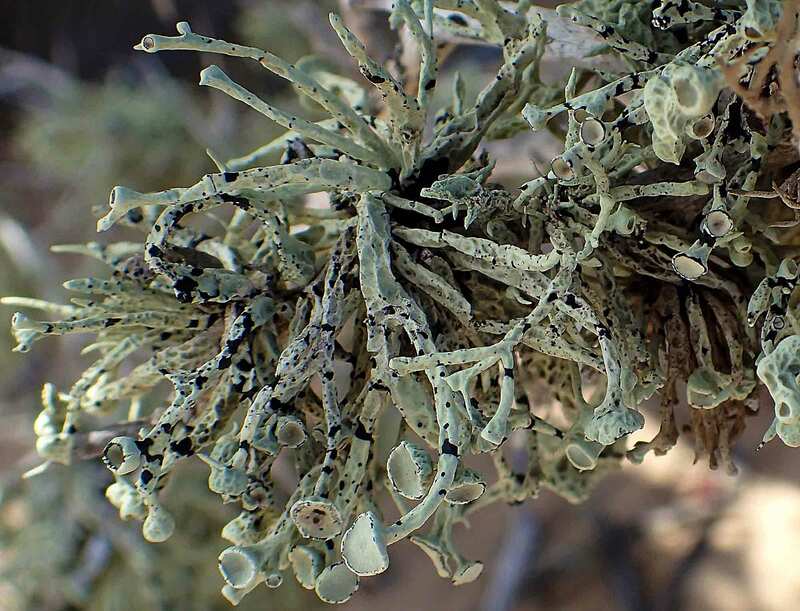 This species seems most common in the Channel Islands, while it also occurs in Namibia (image in V. Wirth, Lichens of the Namib Desert, Hess, Göttingen. 2010). Intermediates appear evident by the spiculiferous branchlets developing nearer the apex of primary branches. 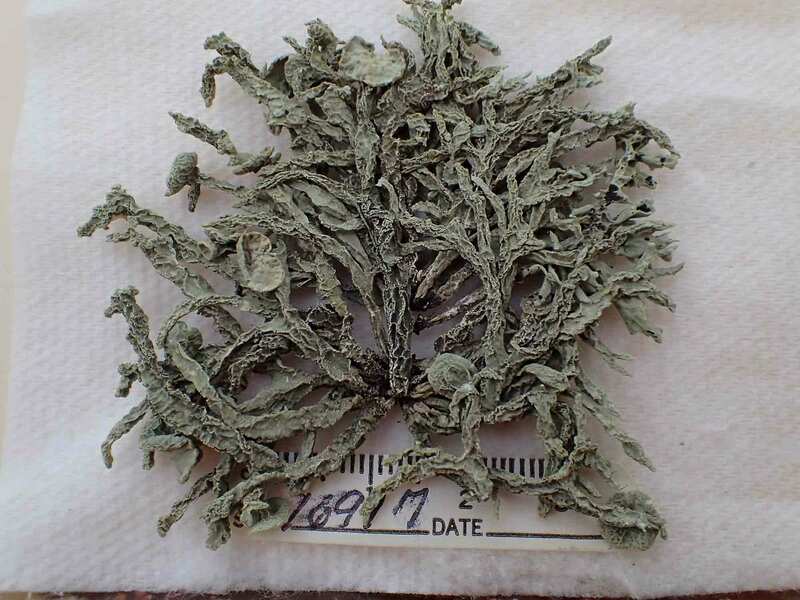 These intermediates may be separated by the presence/absence of depsidones (Spjut 1996); however, thalli with salazinic acid collected in Baja California on rocks or shrubs appear to belong to V. zebrina by the relatively uniform shape of the branches from the thallus base. 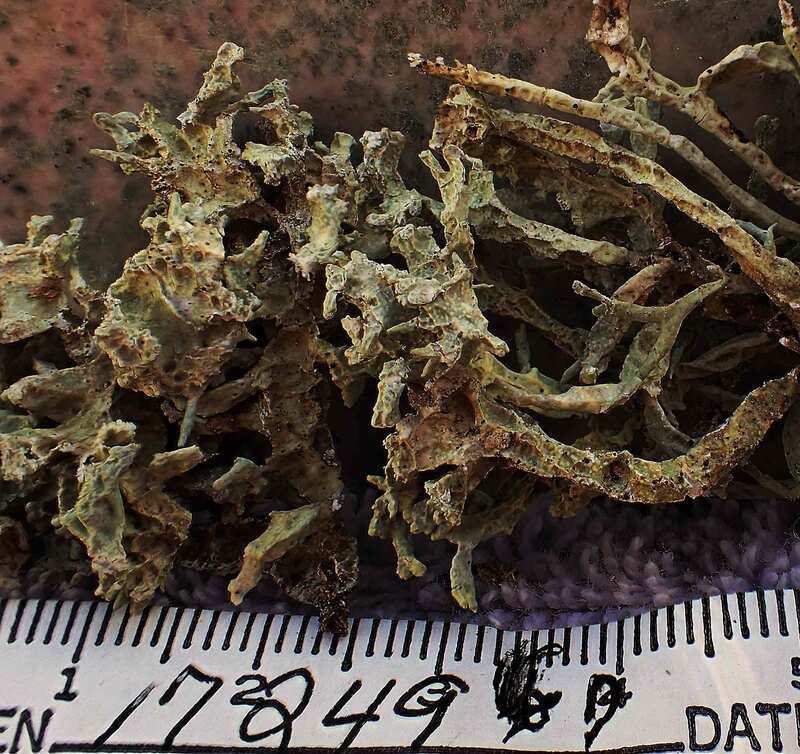 Finally, V. leonis, a species found in BCS and in South America, is distinguished by a thallus of interwoven capillary flexuous branches. 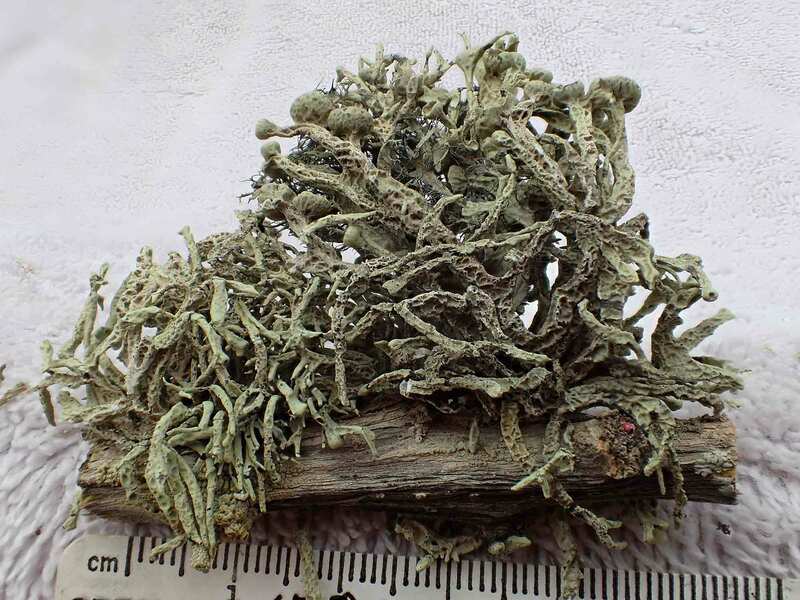 In BCS it commonly occurs with V. tigrina and species of Ramalina. 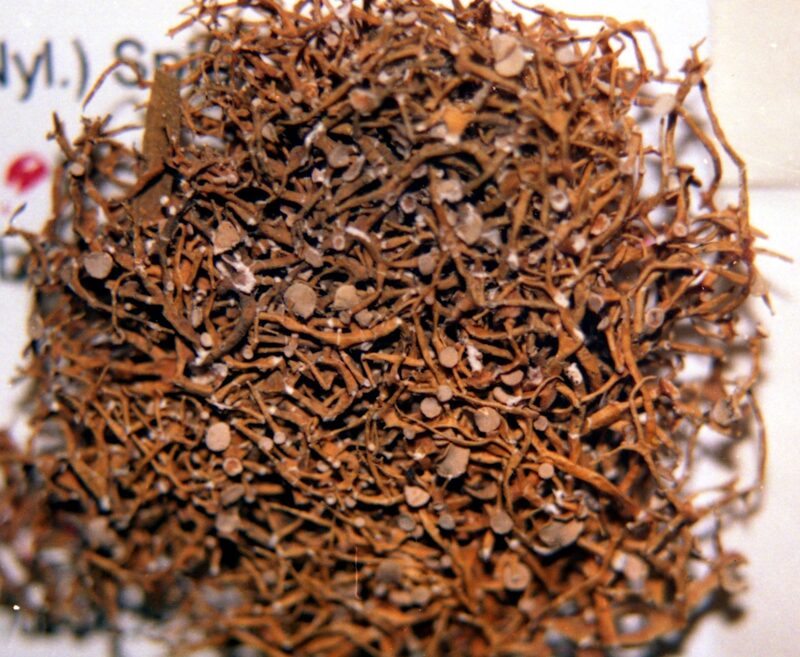 The South American species of Cylindricaria include chemotypes not found in North America. 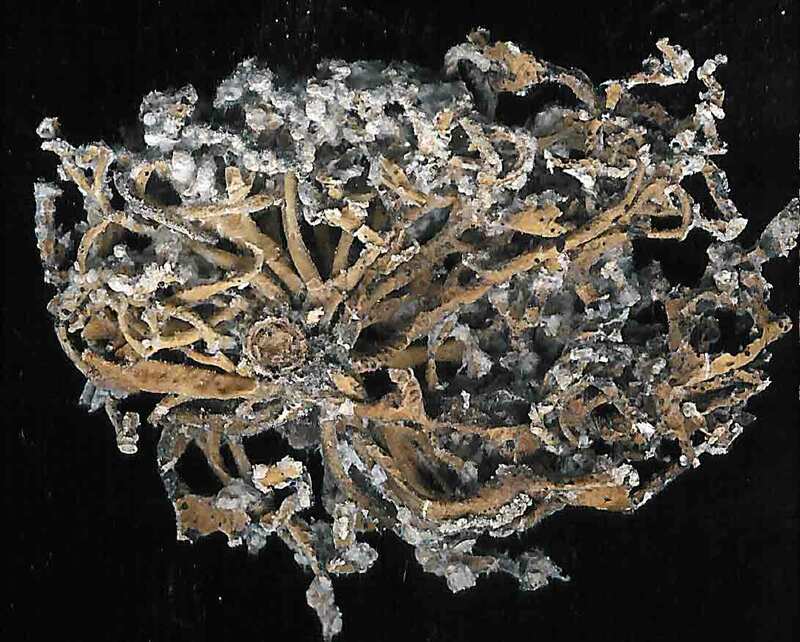 Vermilacinia flaccescens, as mentioned above, was broadly interpreted to include any Ramalina thallus with methyl 3,5 dichlorolecanorate. 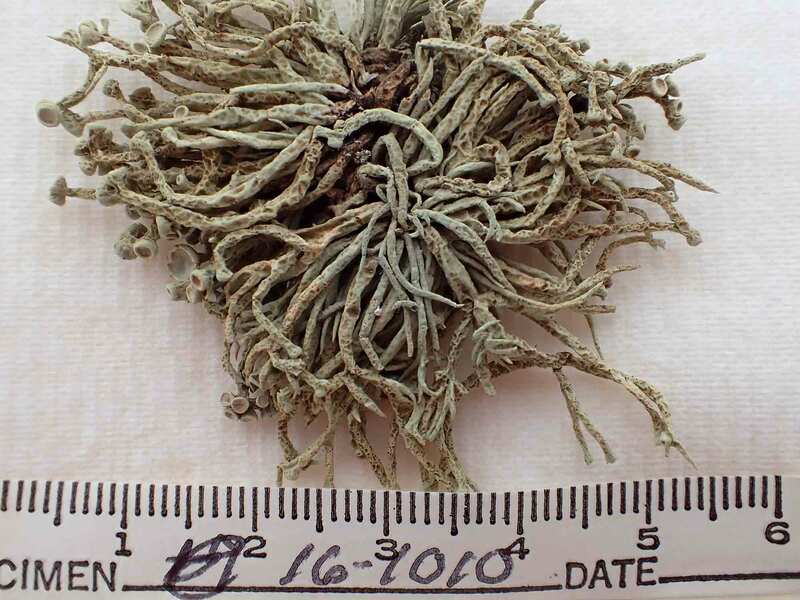 The depside has also been reported in South American species of Ramalina (Spjut 1996). This may have been acquired from hybridization (or via horizontal gene transfer). 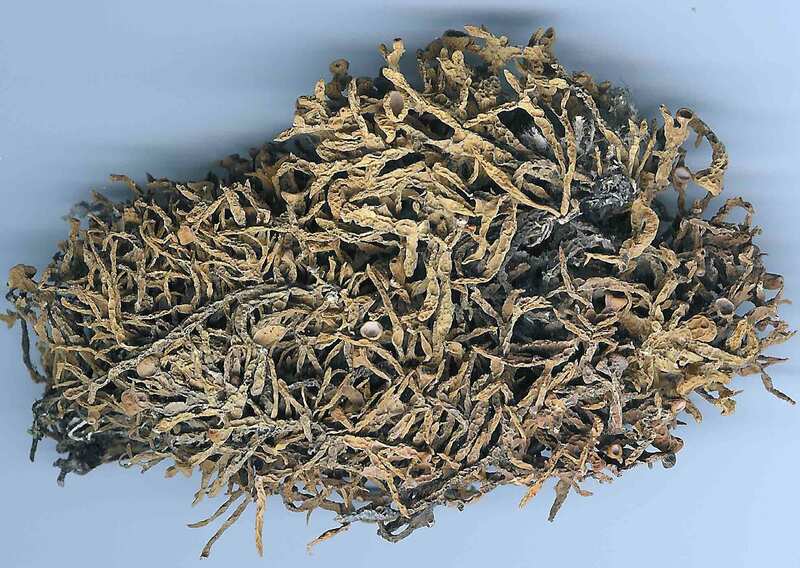 Similar thalli with this depside but without the terpenes have been referred to Vermilacinia cactacearum (Follmann) Follmann & Werner (Schedae ad Lichenes Exsiccati). 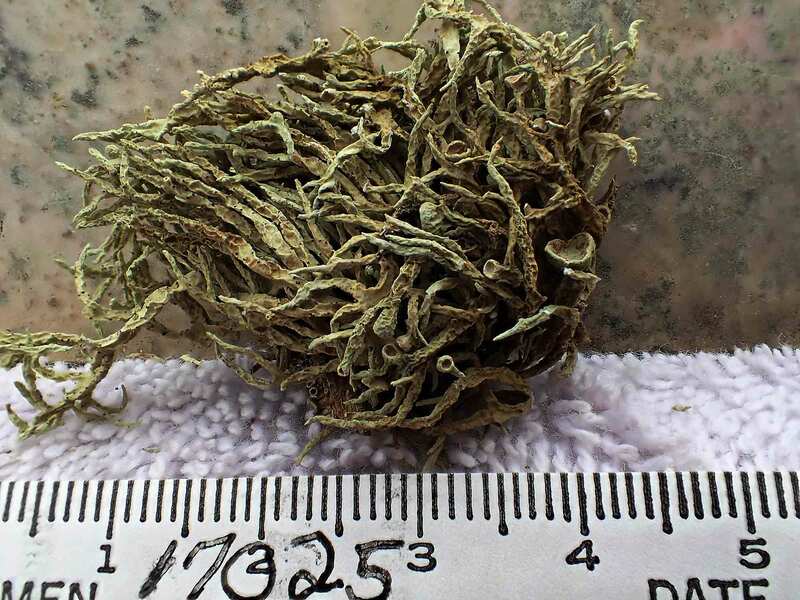 Another South American species, Niebla nashii, reportedly has tumidulin and terpenes; however, the terpenid compounds were not clearly specified. 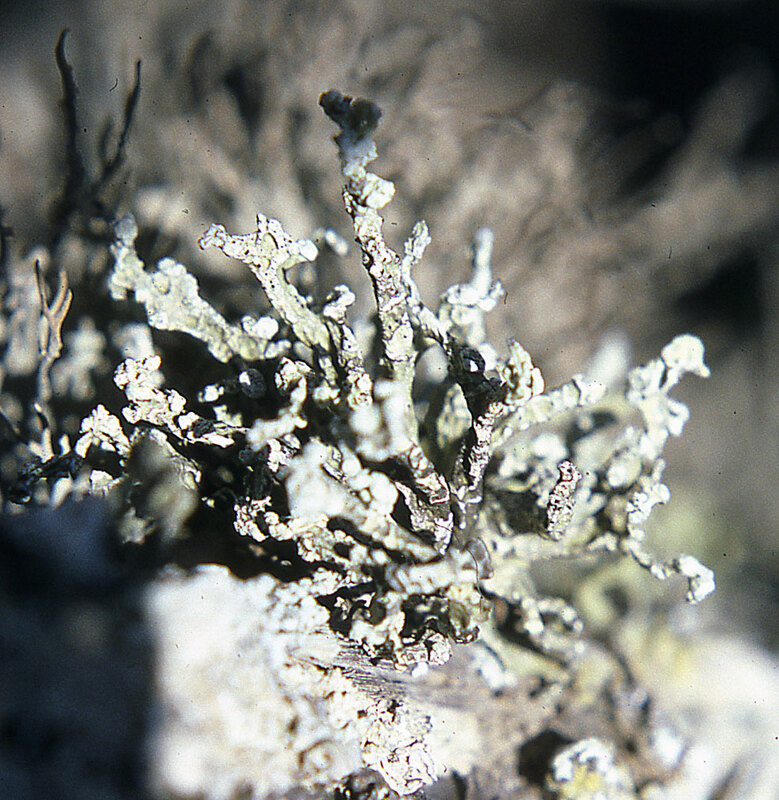 Its placement in the genus Niebla or Vermilacinia is therefore questionable, especially since it lacks pycnidia as well as apothecia (Sipman 2011). 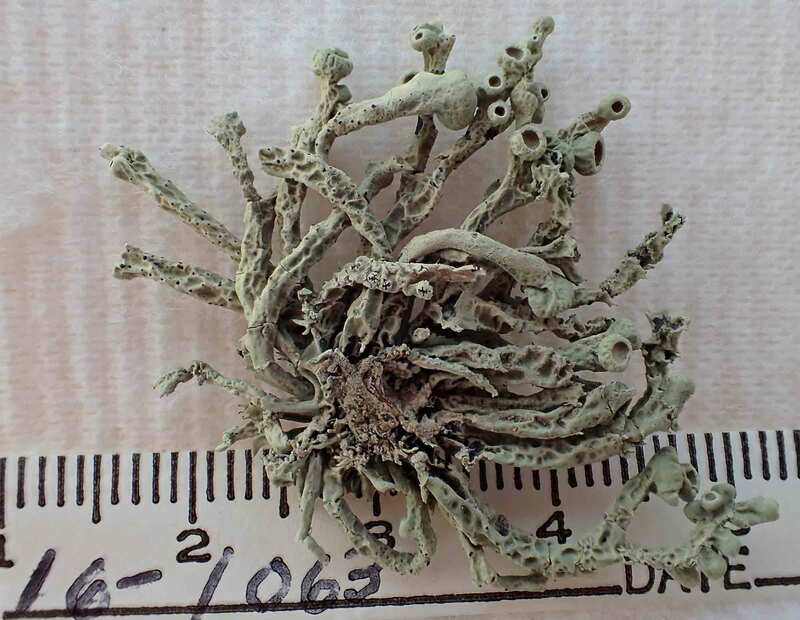 It was also described to have medullary chondroid strands free from the cortex, while its overall resemblance is to Ramalina lacera (With.) J. R. Laundon. 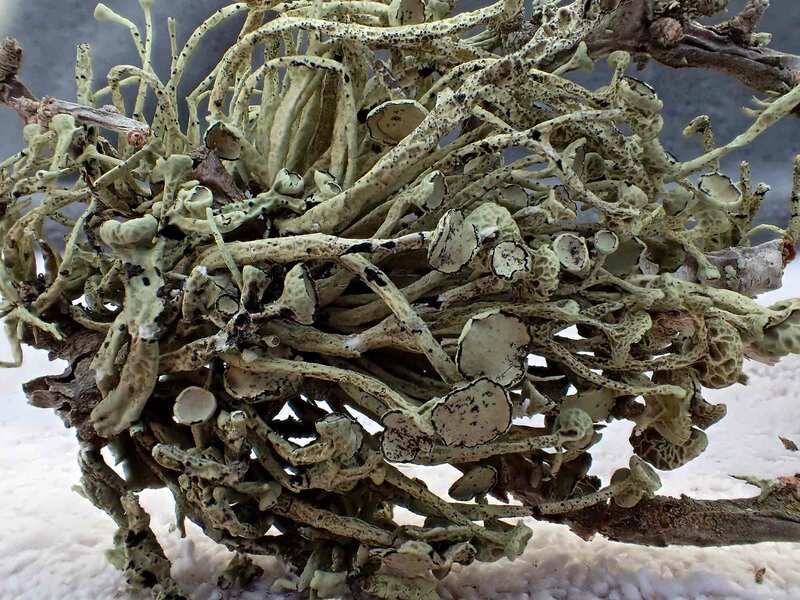 Additionally, the species reportedly has more than one depside, suggesting affinities to the Old World Bourgeana clade of Ramalina (Krog, H. & H. Østhagen. 1980; Sérusiaux et al. 2010). Moreover, "Vermilacinia lacera" (With.) Follm. & Wern. was proposed (G. Follmann & B. C. Werner: Sched. Lich. Exs. Univ. Coloniensis Ed., Fasc. 24, 11. 2003. No. 479), evidently based on chemotaxonomy. The evolutionary ties of North American subgenus Cylindricaria to its South American species are evident in the sorediate species (V. leonis) and the non-sorediate V. cerebra and V. leopardina. The sorediate species and V. cerebra, which were recognized to occur in both Americas, share other key metabolites such as depsidones and bourgeanic acid. Vermilacinia tigrina thalli in South America include a corticolous form with hypoprotocetraric acid and a terricolous form with psoromic acid. In North America, it is corticolous with either norstictic acid, or salazinic acid, or rarely both depsidones are present. Vermilacinia leopardina, distinguished by lacking depsidones, has the same secondary metabolites in both Americas, mostly zeorin and [-]-16 α-hydroxykaurane. The North American thalli referred to V. tigrina, which often differ from V. leopardina in having longer branches with a more sharply corrugated cortex. may prove to be a distinct species, especially if the South American thalli that show differences in habit and chemistry, justify separate species status. 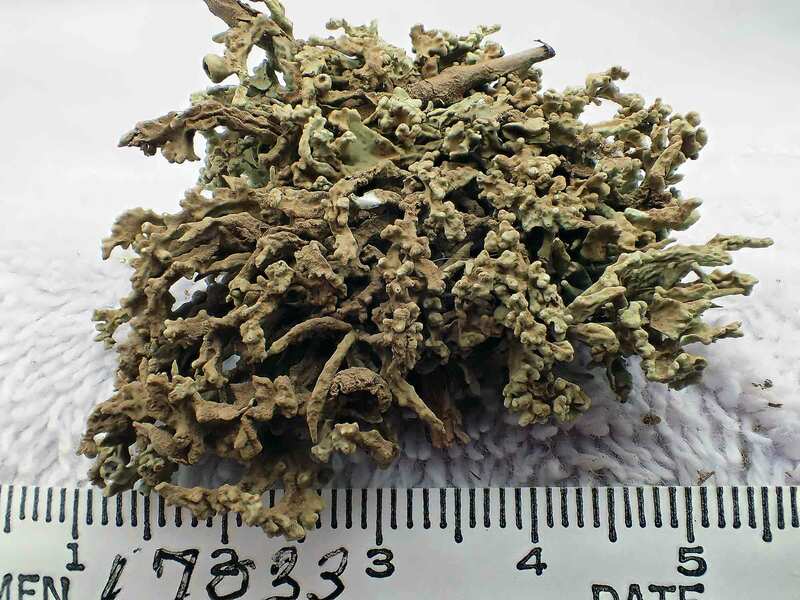 The evolutionary trend in Cylindricaria seems to be loss of secondary terpenoid metabolites, which may have occurred after Cylindricaria were established in both North America and South America. This seems supported by phytogeographcal data for the species on each continent. Examples are the reversed pattern in the diterpene chemistry between the Vizcaíno and northern peninsular species that may have since evolved independently—in the loss of the diterpene—at a time when the Vizcaíno Peninsula was perhaps an island separated from the main Baja peninsula. Species in subgenus Vermilacinia that are defined by unique triterpenoid compounds appear endemic to the coastal Vizcaíno Desert where V ligulata occurs only along the eastern coast of Isla Cedros and directly across on the adjacent Baja peninsula, that of V. rosei is known from three scattered collections ranging from Isla San Roque, near Bahía de Tortugas, and Isla Cedros, and that of V. reptilioderma, also endemic to the western Vizcaíno peninsula and nearby Isla Cedros. They may be descendants of a more widespread ancestral species complex; yet, have independently differentiated morphologically, or perhaps the unique triterpenoid genes were acquired via hybridization (or HGT). In Niebla, the depsidone species group may also have evolved on an island in the Vizcaíno Desert Region that—after connection to the mainland peninsula—later spread north to the California chaparral-desert ecotone and west to the Vizcaíno Desert area and from there to the southern part of Isla Cedros. 1(0). 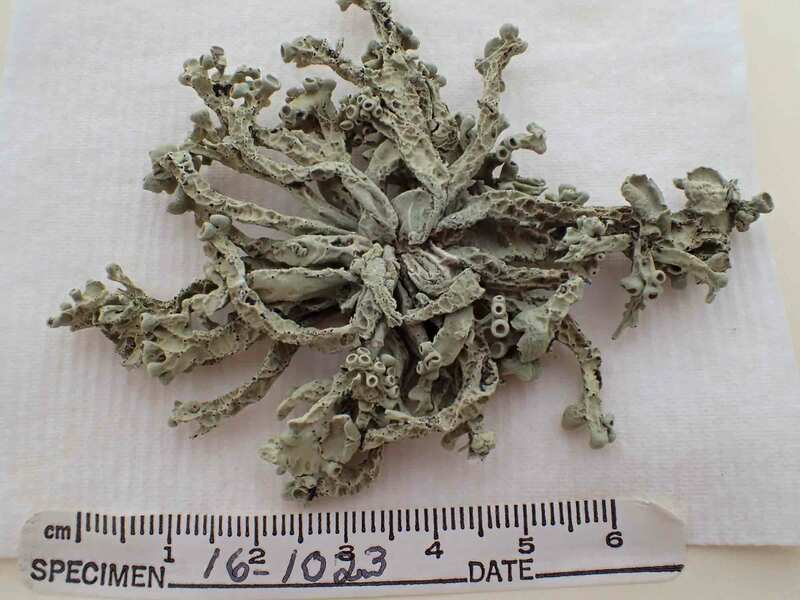 Thallus with methyl 3,5 dichlorolecanorate; South America. Bowler, P.A. 1981. Cortical diversity in the Ramalinaceae. Canad. __________, R. E. Riefner, Jr., P. W. Rundel, J. Marsh & T.H. western North America. 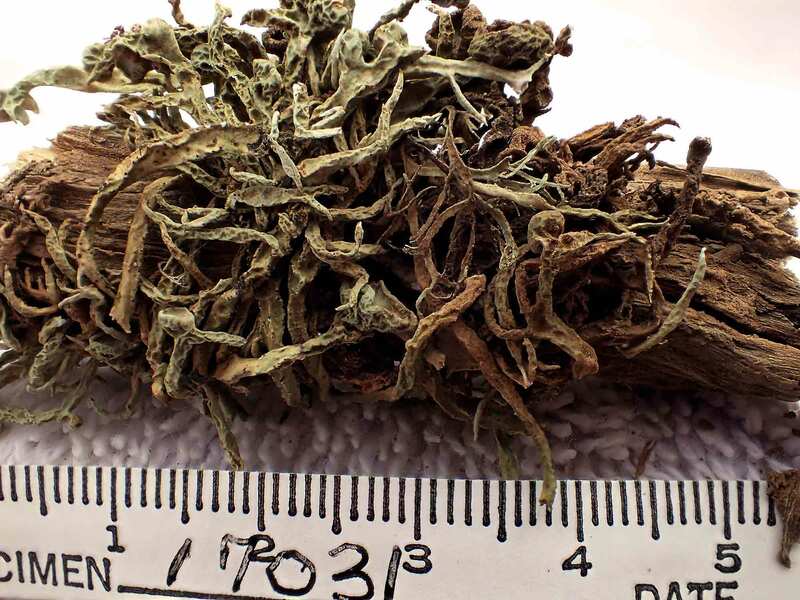 Phytologia 77: 23-37. __________ and J. Marsh. 2004. Niebla. 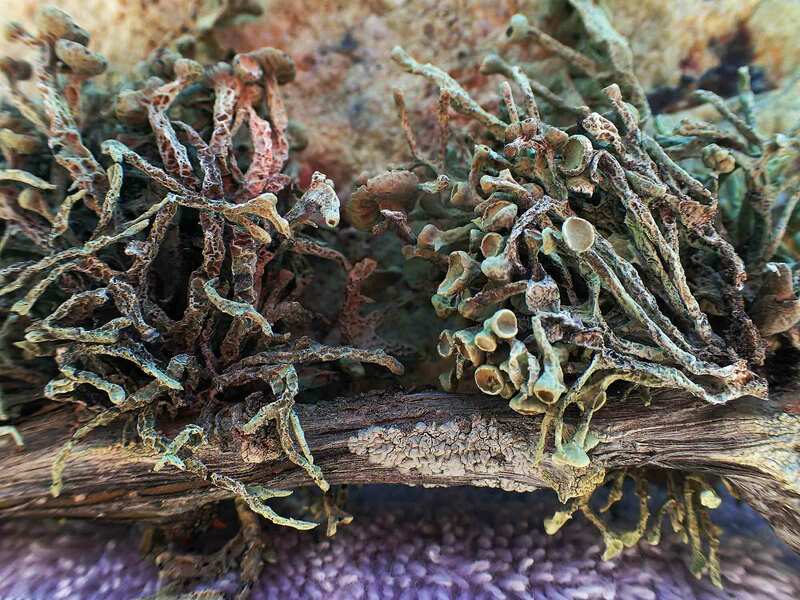 ‘Lichen Flora of the Greater Sonoran Desert 2’: 368–380. Diederich, P. 2007. 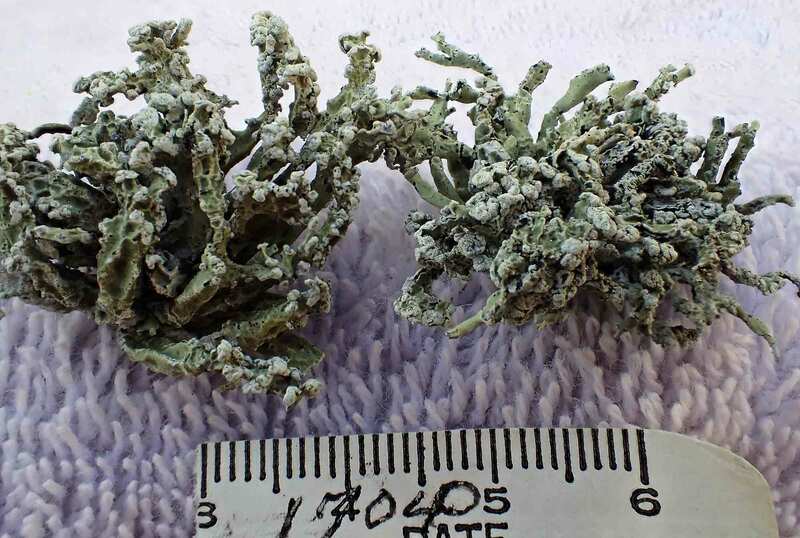 New or interesting lichenicolous Heterobasidiomycetes. Opuscula Philolichenum 4: 11–22. Follmann, N. G. (1994). 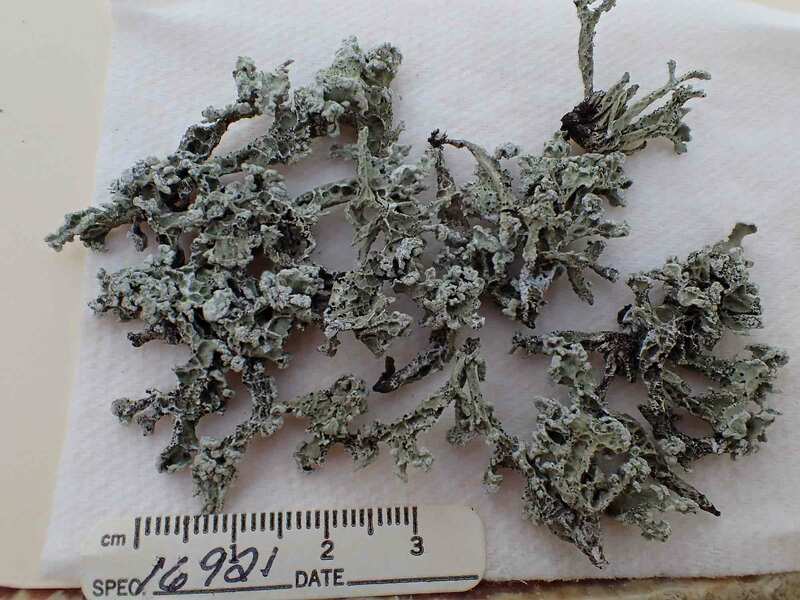 Darwin's “lichen oasis” above Iquique, Atacama Desert rediscovered. 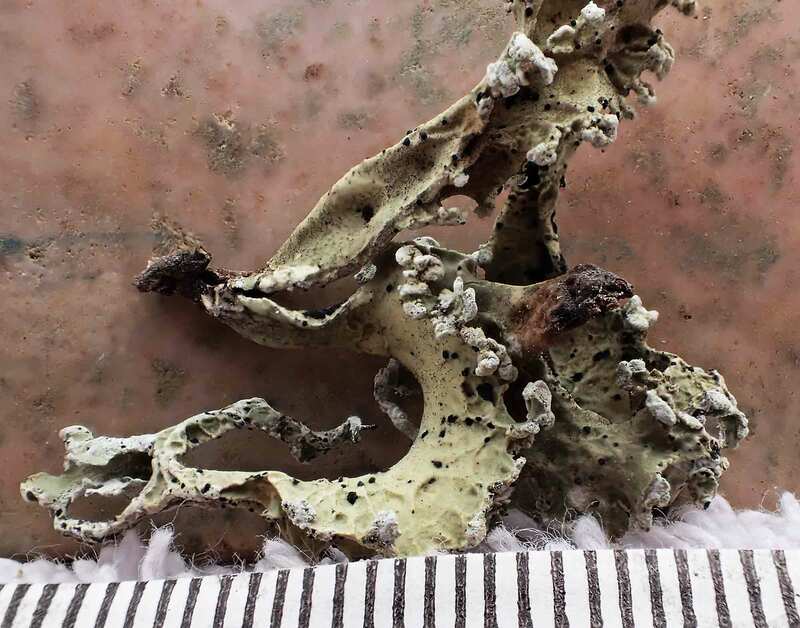 International Lichenological Newsletter 27: 23-25. Herre, A. W. C. T. 1906. 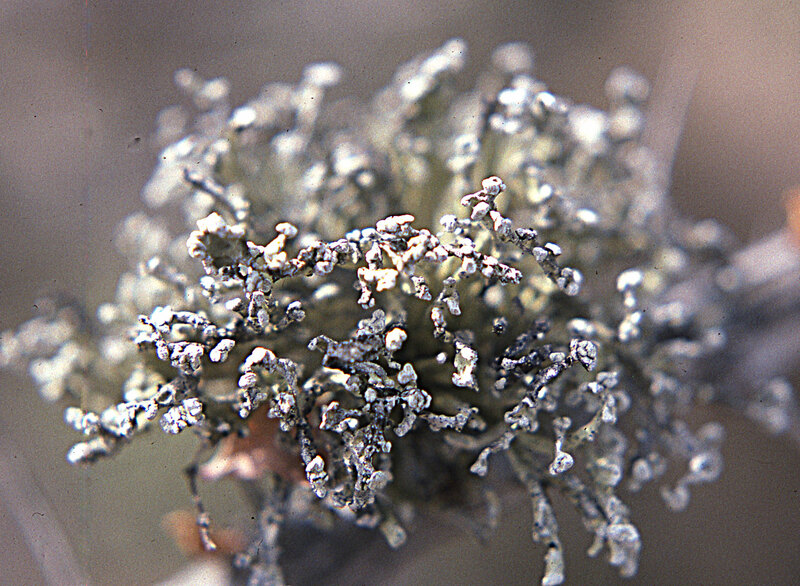 The foliaceous and fruticose lichens of the Santa Cruz Peninsula, California. Proc . Acad. Sci. Washington 8: 325–396. Krog, H. & H. Østhagen. 1980. 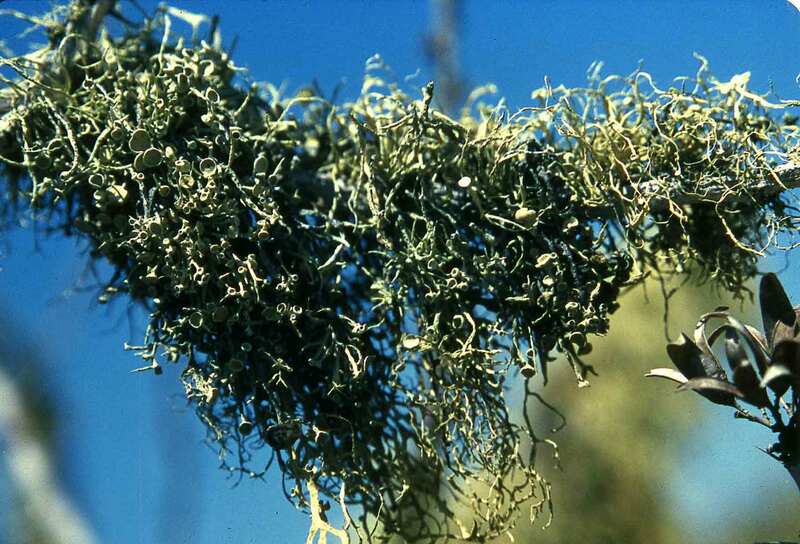 The genus Ramalina in the Canary Islands. Norwegian J. Bot. 27:255-296. Nylander W. 1870. Recognitio monographica Ramalinarum. Bull. Soc. Linn. Normandie, Sr. 2, 4:101–181. Riefner Jr., R. E., P. A. Bowler, J. Marsh & T. H. Nash III. 1995. 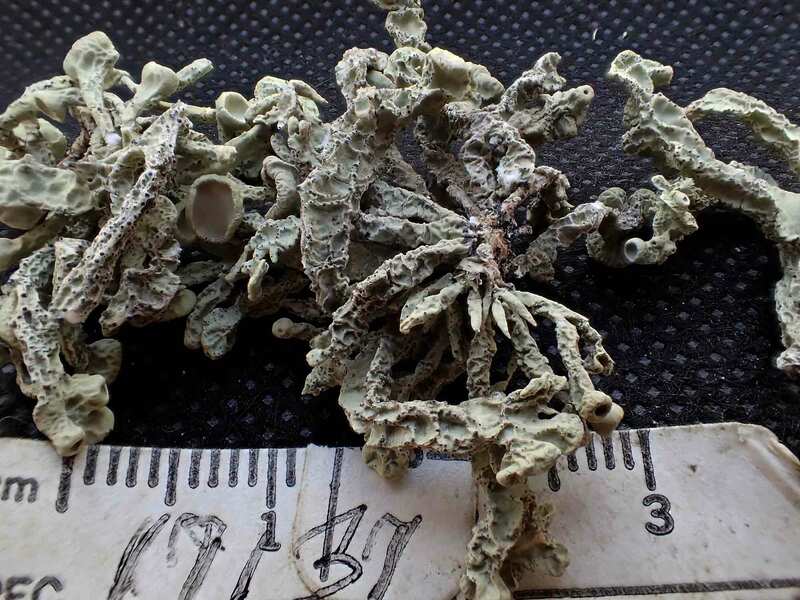 Niebla tuberculata (Ramalinaceae): A new lichen from California. Mycotaxon 54: 397-401. Sérusiaux, E., P. Van den Boom, and D. Ertz. 2010. 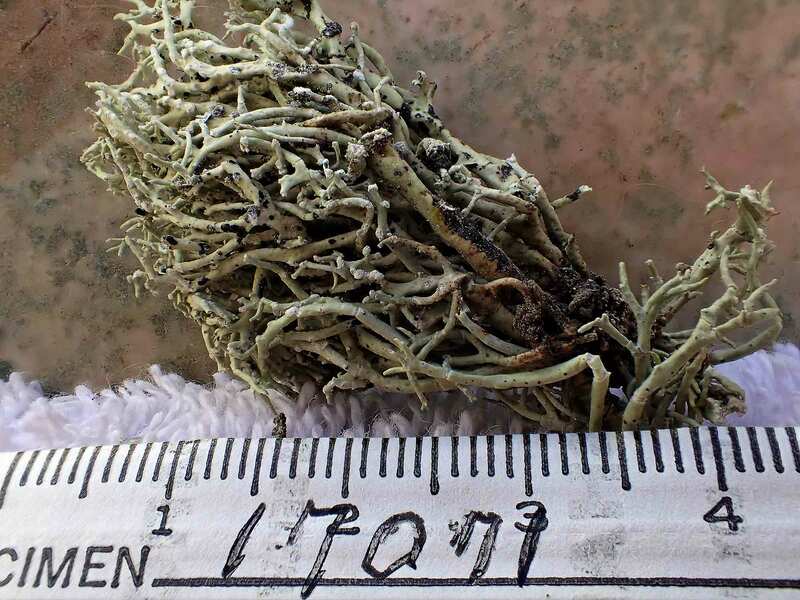 A two-gene phylogeny shows the lichen genus Niebla (Lecanorales) is endemic to the New World and does not occur in Macaronesia nor in the Mediterranean basin. Fungal Biology 114: 528-37. Sipman, H.J.M. 2011. New and notable species of Enterographa, Niebla, and Sclerophyton s. lat. from coastal Chile. Bibliotheca Lichenologica 106: 297-308. Smithsonian Institution. 1990 (Jan. 9). National Museum of Natural History. 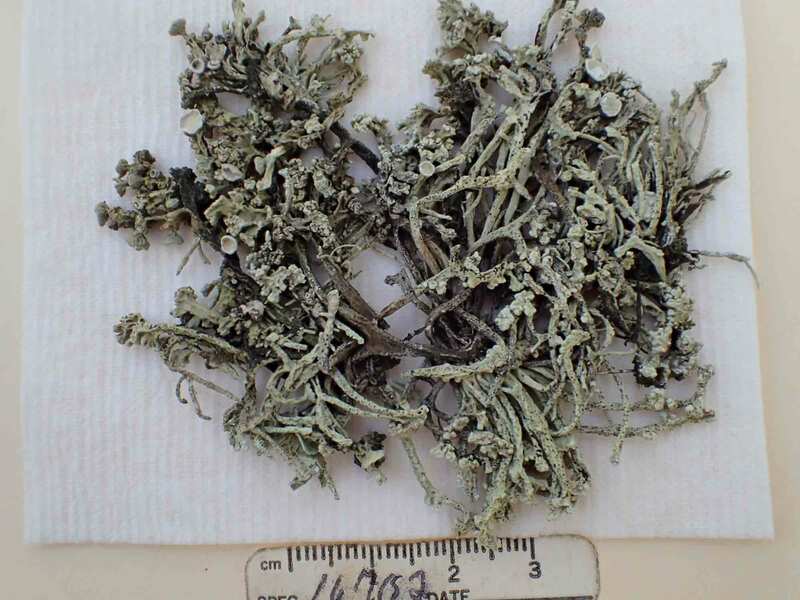 Letter from the Director to Dr. Richard Spjut indicating renewal of his appointment as Associate and Collaborator, with particular emphasis on Dr. Spjut's study of the lichens of Baja California. Contr. 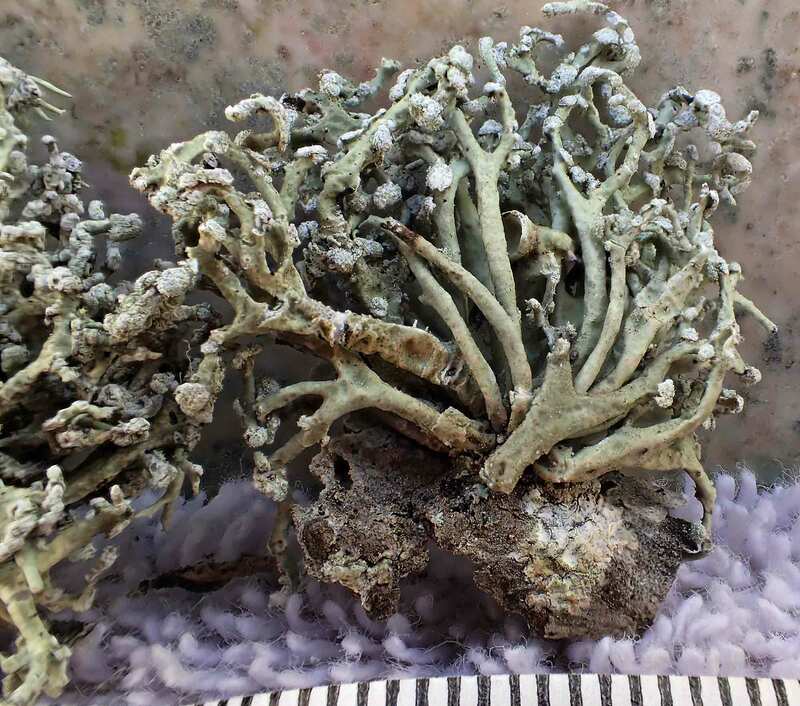 Lichen. in honor of Gerhard Follmann, F. J. A. Daniels, M.
Schulz & J. Peine, eds., Koeltz Scientific Books, Koenigstein. _________. 1996. Niebla and Vermilacinia (Ramalinaceae) from California and Baja California. Sida, Botanical Miscellany 14: 1–207, 11 plates. _________. 1997. The California Floristic Element on Isla Cedros. 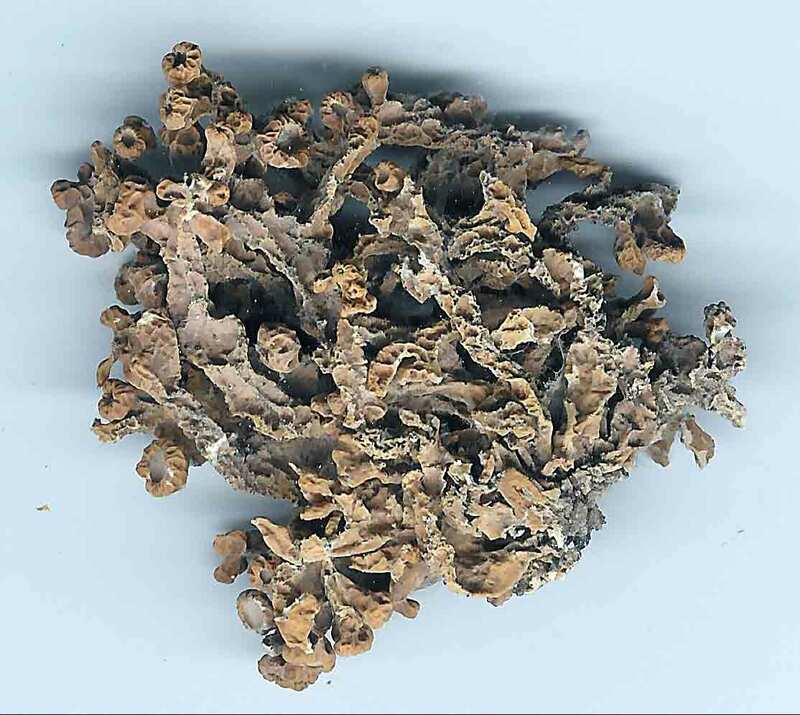 Paper presented at the Baja California Botanical Symposium, Aug 14-16, Museum of Natural History, San Diego, Abstract. Trevisan, V. G. 1861. Ueber Atestia eine neue Gattung der Ramalineen aus Mittel-Amerika. Flora 4:49-53. Tuckerman, E. 1866. 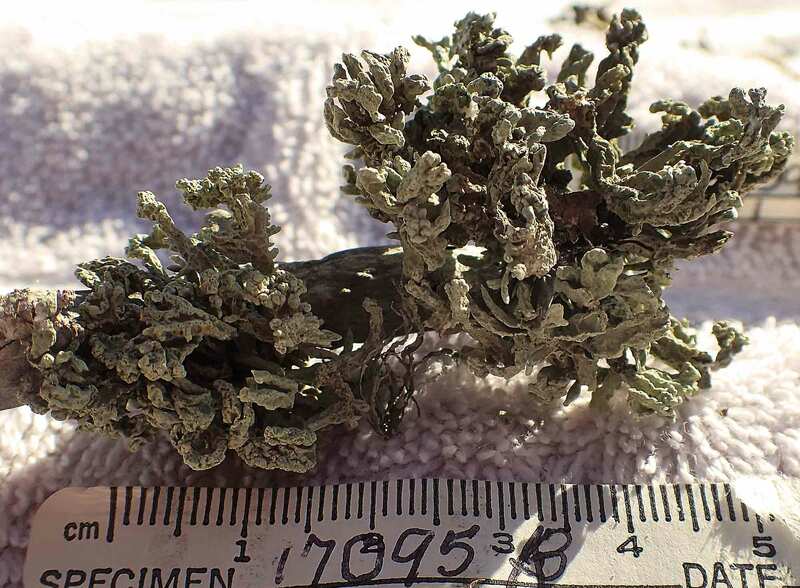 Lichens of California, Oregon and the Rocky Mountains; as far as yet known. J.S. & C. Adams, Amherst, MA. Tuckerman, E. 1882. 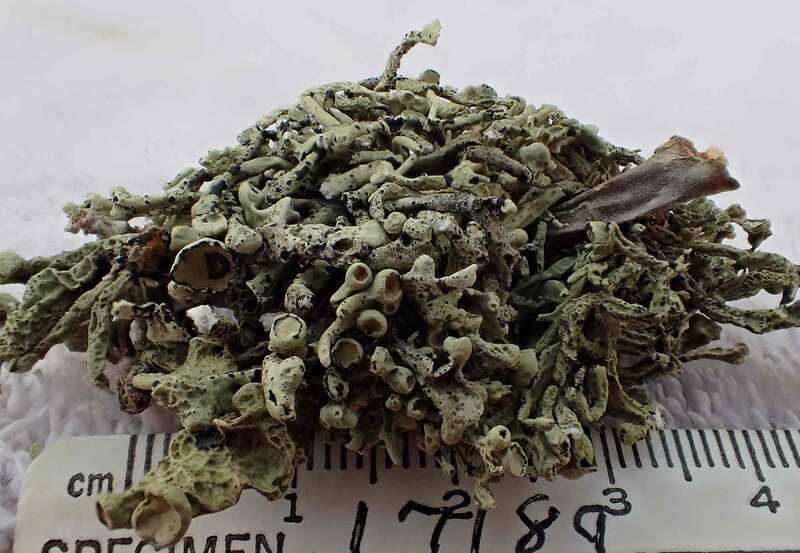 Synopsis of the North American Lichens Pt 1. S.E. Cassino, Publishers, Boston. Vermilacinia acicularis Spjut, Sida Botanical Miscellany 14: 152. 1996. Numeris 541–560, 2004. Basionym: Desmazieria cactacearum. 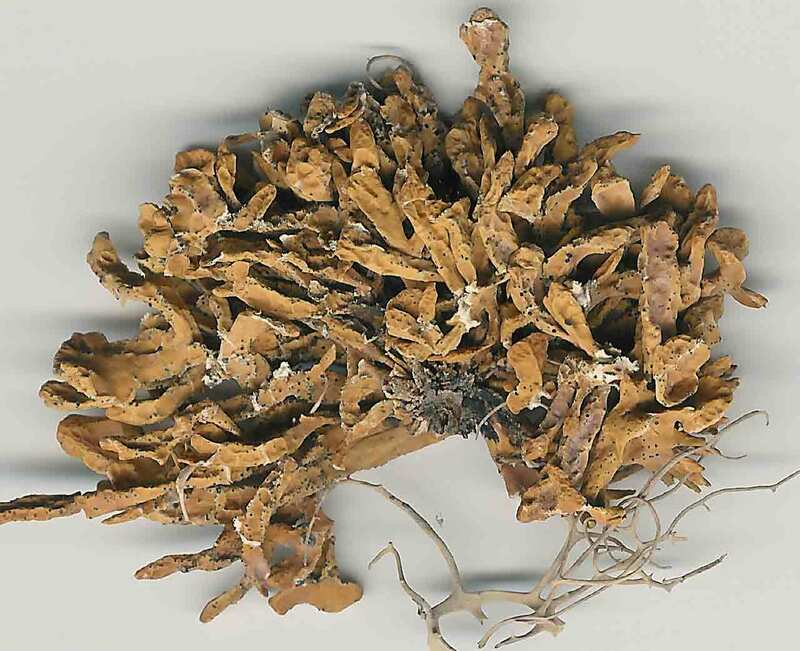 Vermilacinia cerebra Spjut, Sida Botanical Miscellany 14: 181, 1996. Vermilacinia ceruchis (Acharius, Methododus 260. 1803) Spjut & Hale, Flechten Follmann 345. 1995. Miscellany 14: 152. 1996. Basionym: Niebla ceruchoides. Vermilacinia corrugata Spjut, Sida Botanical Miscellany 14: 183. 1996. Vermilacinia granulans (Sipman) Spjut ined. Vermilacinia howei Spjut, Sida Botanical Miscellany 14: 187, 1996. Vermilacinia johncassadyi Spjut, Sida Botanical Miscellany 14: 162. 1996. Vermilacinia leonis Spjut, Sida Botanical Miscellany 14: 189. 1996. Vermilacinia leopardina Spjut, Sida Botanical Miscellany 14: 190. 1996. Vermilacinia ligulata Spjut, Sida Botanical Miscellany 14: 165. 1996. Vermilacinia nylanderi Spjut, Sida Botanical Miscellany 14: 192. 1996.
to BCMEX and LA. Name was validly published. Vermilacinia pumila Spjut, Sida Botanical Miscellany 14: 169. 1996. Vermilacinia reptilioderma Spjut, Sida Botanical Miscellany 14: 171. 1996. Vermilacinia rigida Spjut, Sida Botanical Miscellany 14: 172. 1996. Vermilacinia roccellaeformis (Bory) Spjut ined. Vermilacinia rosei Spjut, Sida Botanical Miscellany 14: 175. 1996. Vermilacinia tumidula (Taylor) Spjut ined. Vermilacinia varicosa Spjut, Sida Botanical Miscellany 14: 176. 1996. Vermilacinia vesiculosa Spjut, Sida Botanical Miscellany 14: 177. 1996. Vermilacinia zebrina Spjut, Sida Botanical Miscellany 14: 195. 1996.